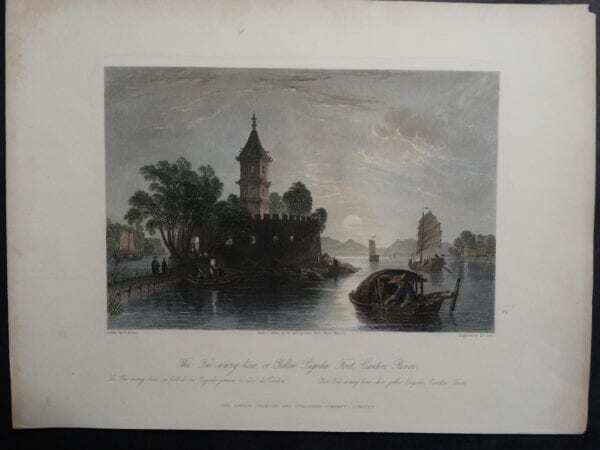 Foreign Views of China, Italy, Sweden, Bavaria, Castles & more! 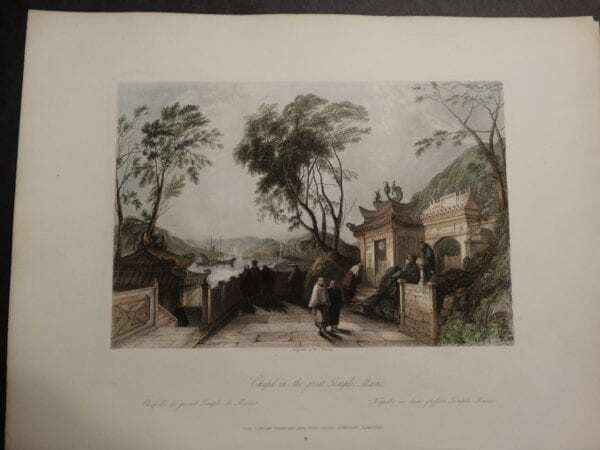 Foreign Views of China by Thomas Allom, Italy by Luigi Rossini, Scandanavia by Colonel Dahlberg, and rare engravings of Bavarian Castles from the early 1700’s. Enjoy my online gallery of antique prints. Call us at 413-245-4197 because we would like to help you! Foreign Views of Life in China by Thomas Allom, 1855. Foreign View of Life in China in 1855. 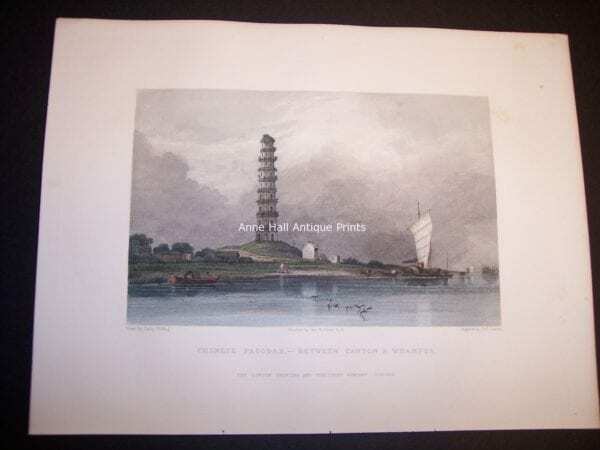 The Tai-wang-kow or Yellow Pagoda Fort, Canton River $150. dsc02391 Foreign View China 1855. Raree Show at Lin-sin-choo $150. 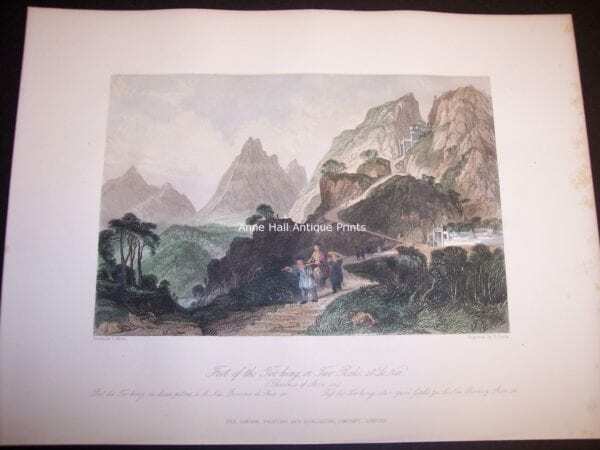 Foreign View from Life in China, 1855. 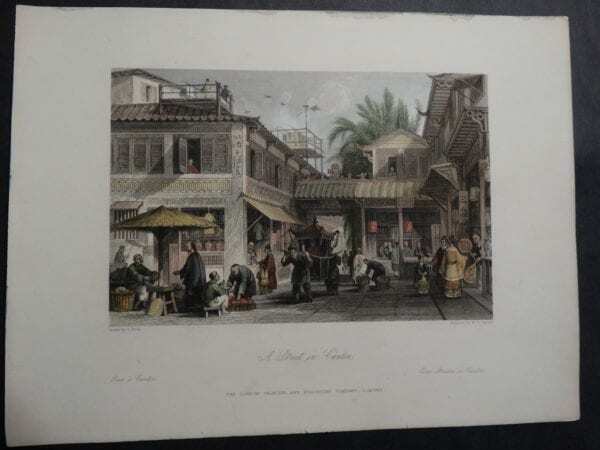 A Street in Canton Hand Colored Engraving. $150. DSC02393 Apartment in a Mandarin House, near Nanking by Thomas Allom 1855 $150. DSC02394 Foreign Temple in the great Temple, Macao. 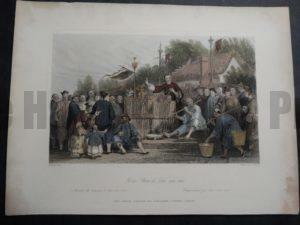 1855 Hand colored. Rare glimpse of life in China durint the mid 1800’s. $150. DSC02395 Allom China 1855 Hall of Audience Palace of Yuen min Yuen, Peking. $150. 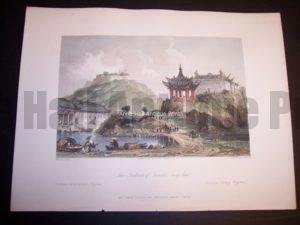 DSC02396 Allom House of Consequa, a Chinese Merchant…Canton $150. DSC02397 Canton Barge-men, fighting quails.. Thomas Allom 1855 hand colored engraving $150. DSC02398 Allom Chinese Offerings for departed Relatives. Hand colored $150. 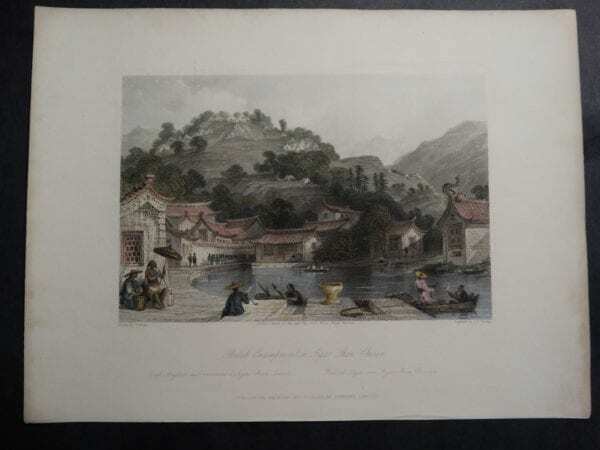 DSC02399 Allom China British Encampment Chasan $150. DSC02400 Alloms China Five Horses Heads. or The Ou-ma-too, 1855 hand colored engraving $150. 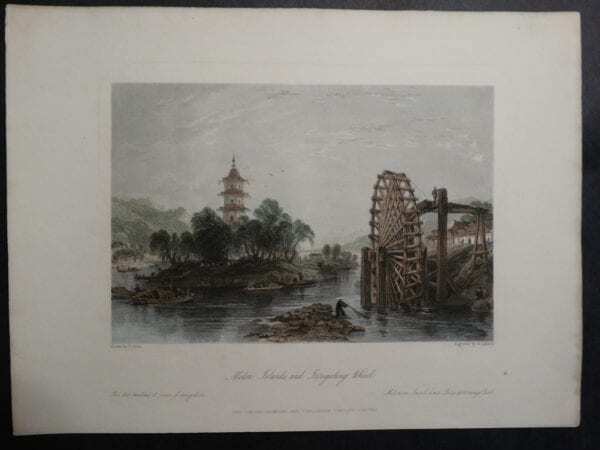 DSC02401 China 1855 Melong Islands and Irrigating Wheel Thomas Allom engraving $150. DSC02402 China Military Station near the City of Chokian. 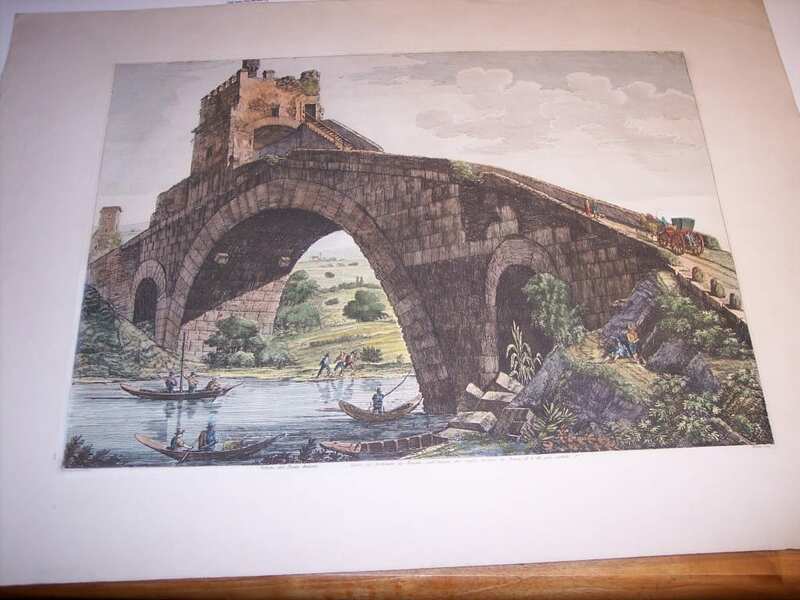 Hand colored engraving from 1855. $150. DSC02403 Temple of Buddah, Canton by Allom. 1855 Hand colored engraving. $150. DSC02404 Kite Flying at Hae-kwan, on the ninth day of the ninth moon. 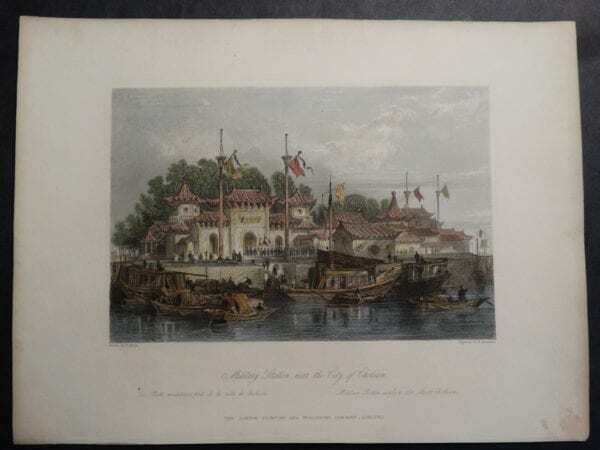 Thomas Allom, 1855 engraving on rag with water colors. $150. DSC02405 Pole Temple, The Tai-Hou by Allom. Steel engraving with water colors $150. 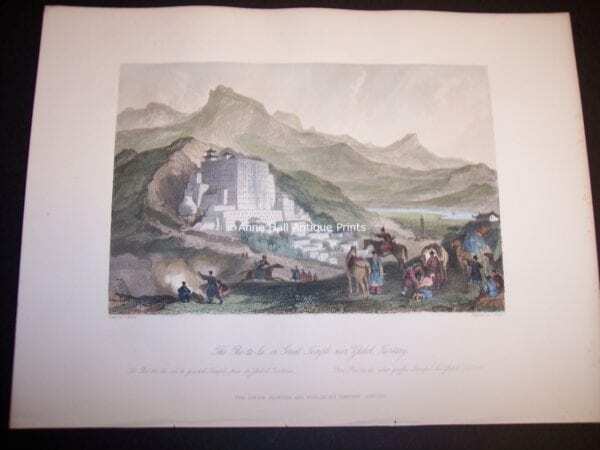 DSC02406 Great Temple near Zhehol, Tartary by Allom 1855 $150. 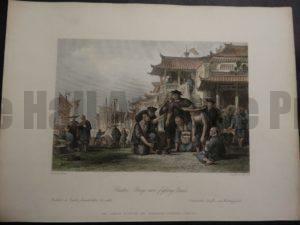 DSC02407 Chinese Cat Merchants by Thomas Allom 1855. 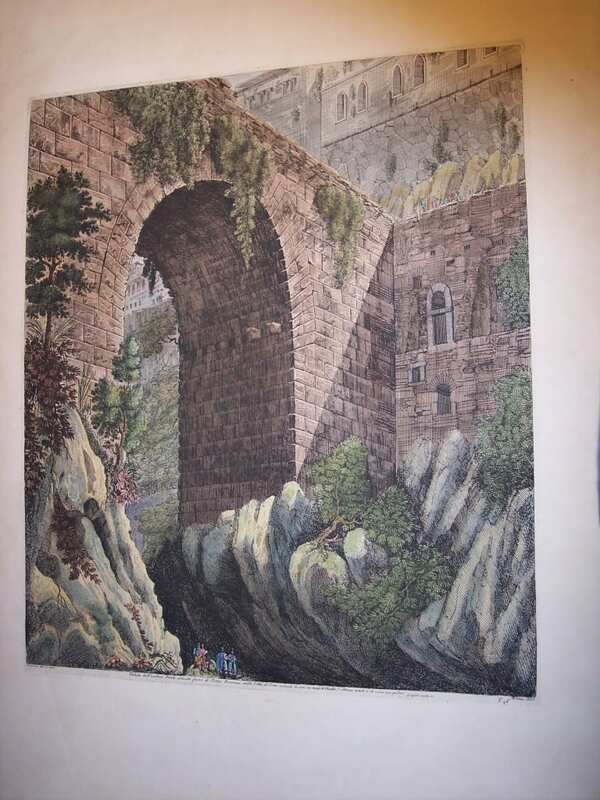 Hand colored engraving $150. Foreign Views Allom’s China, difficult to find yet these are specially priced at $135. each. These old hand colored steel engravings of China are the illustrations of Thomas Allom. They are antiques, produced in the mid 19th Century, and very close to 1855. 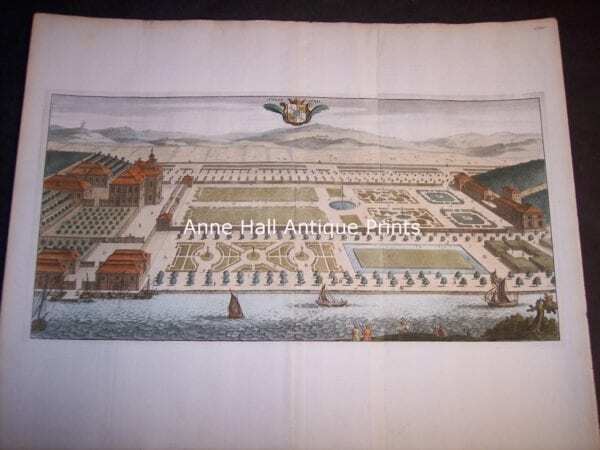 The original illustrations or art work of Allom’s was transferred onto a specially prepared steel plate followed by meticulous engraving. Tremendous detail was the end result. Steel has such a hard surface, on a sheet or plate of steel, the engraver’s detail could be extremely fine. Almost like a black and white photo. 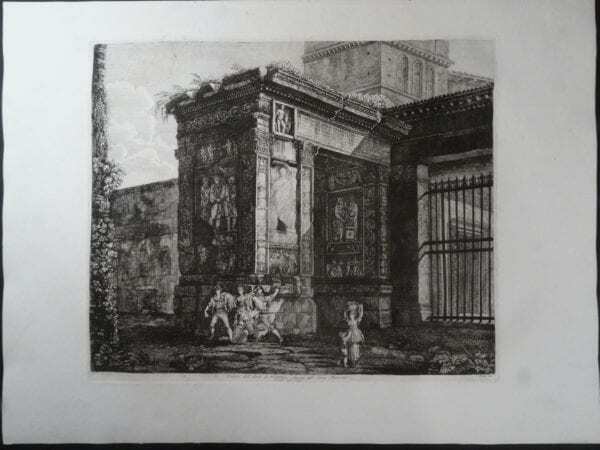 With the effect of shading produced through technique in engraving on steel. 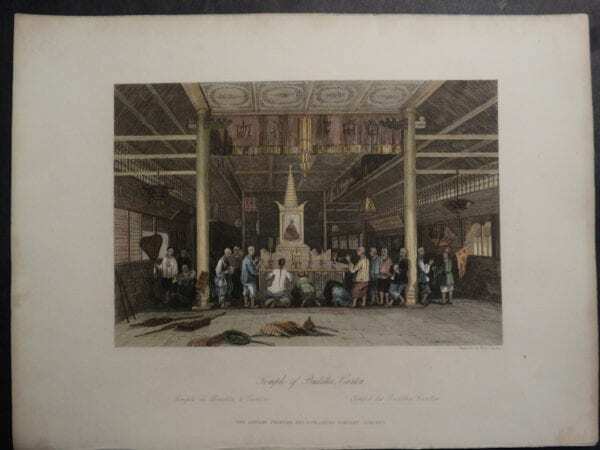 The plate was inked up carefully and printed onto a sheet of high quality woven rag paper. The water colors in these Antique Chinoiserie Prints was professionally added. 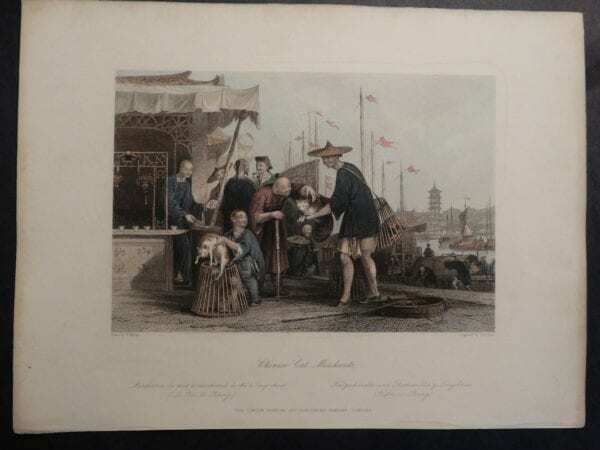 Each old Chinese print measures @8×11″ $135 each. Click here to contact us. Two Peaks at Le Nai, Chinoiserie Engraving from 1855. $135. 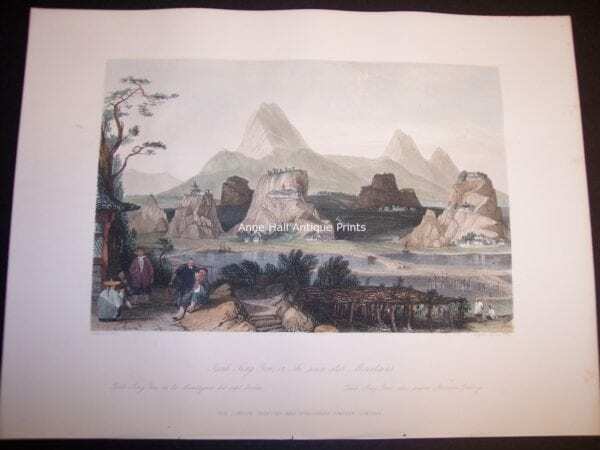 The Seven Star Mountains, Chinoiserie Engraving from 1855. $135. 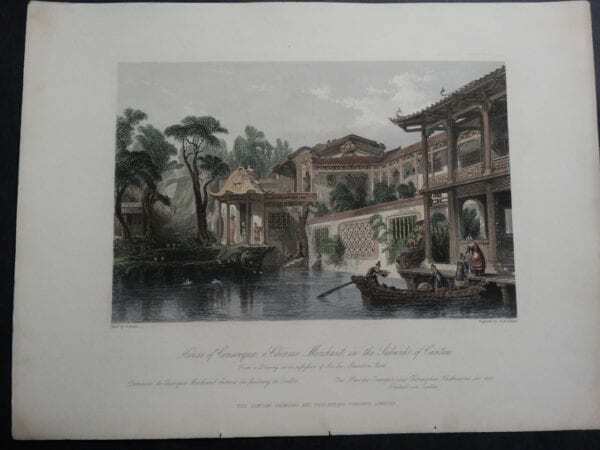 Chinese Pagodah, Chinoiserie Engraving from 1855. $135. 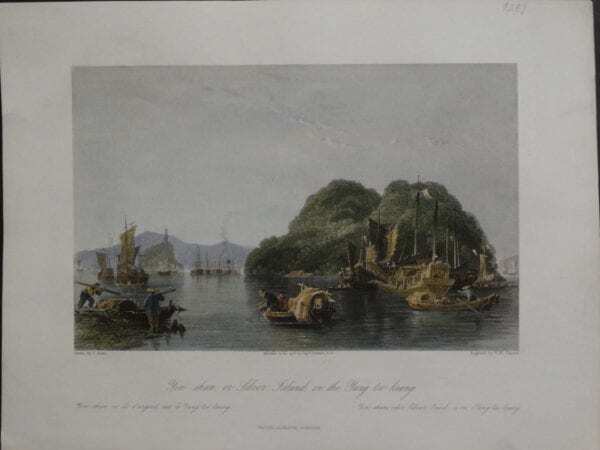 Mouth of the River Chin-keang. 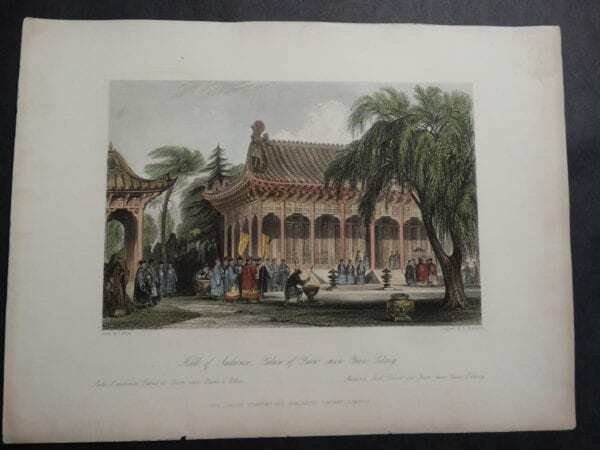 Chinoiserie Engraving from 1855. $135. Great Temple. 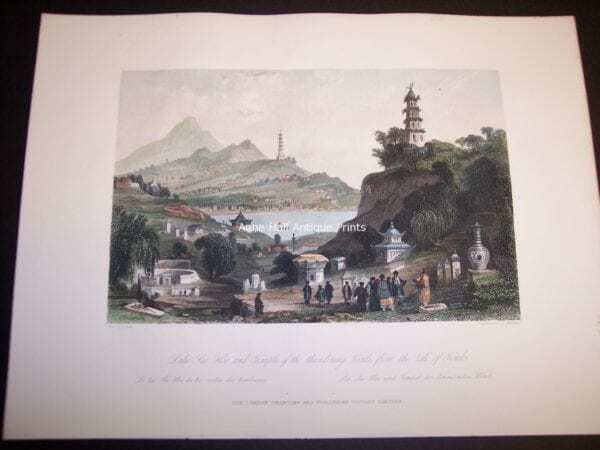 Chinoiserie Engraving from 1855. $135. 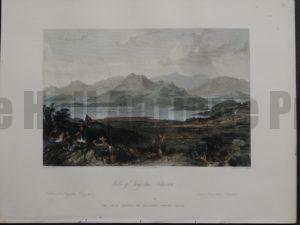 Lake See Hoo, Hand Colored Engraving from 1855. $135. Ancient Tombs near Amoy China, from Life in China, 1855!. $135. 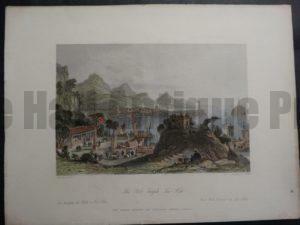 Fortress of Terror, Chinoiserie Engraving from 1855. $135. 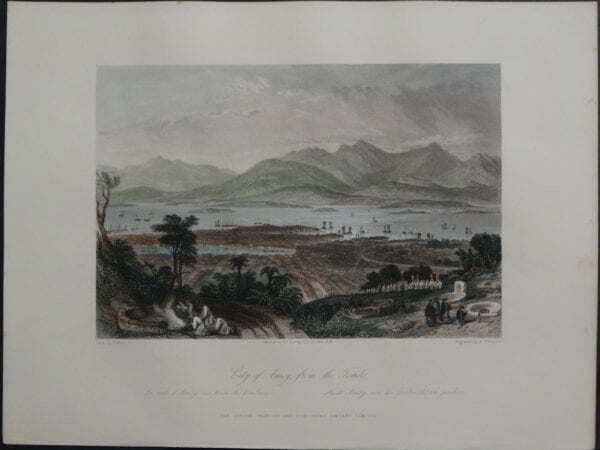 City of Amoy, from the Tombs, 1855. $135. 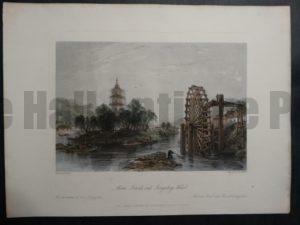 Allom Life in China Antique Engraving. Yin-shan, or Silver Island, on the Yang-tse-keang, 1855. $135. 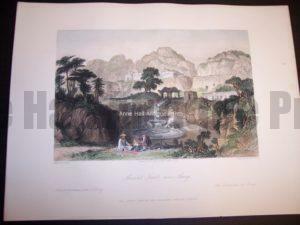 Allom Life in China Antique Engraving. 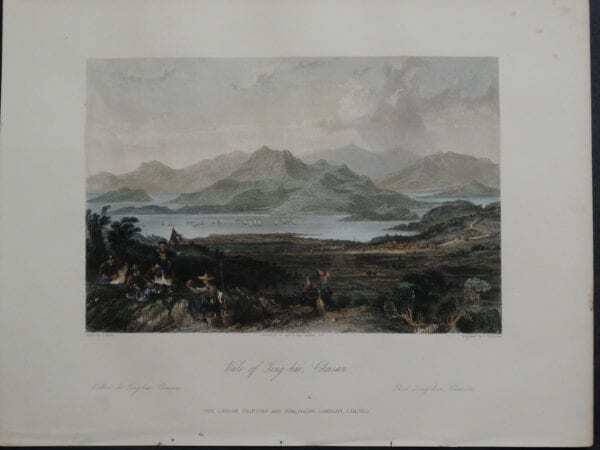 Vale of Ting-hai, Chusan, 1855. $135. 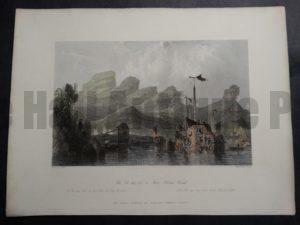 Gibraltar 1855. 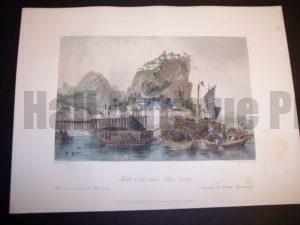 Allom Life in China Antique Engraving. $135. 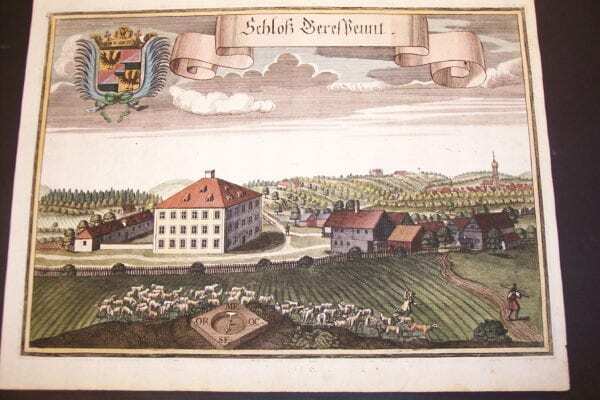 Decorative Views of Bavaria. 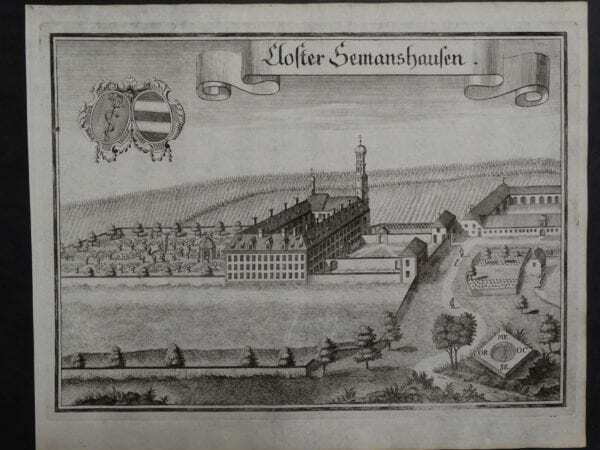 Date 1703. Rare copper plate engravings on hand made hand laid rag paper. Click here to contact us. 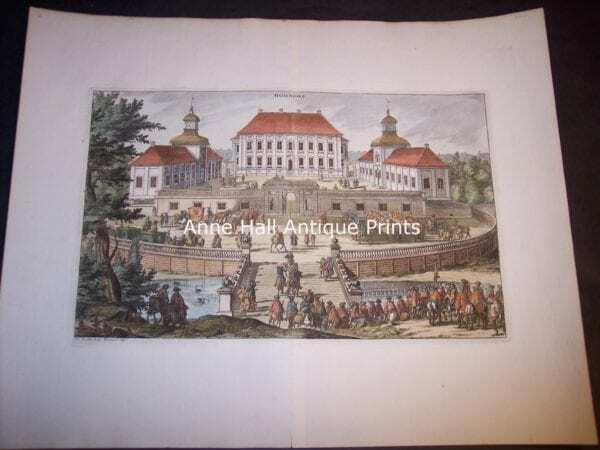 Werning Bavaria Rare Castle 1 Michael Wening Engraving 1703 In Stock. Pay with PayPal. $250. 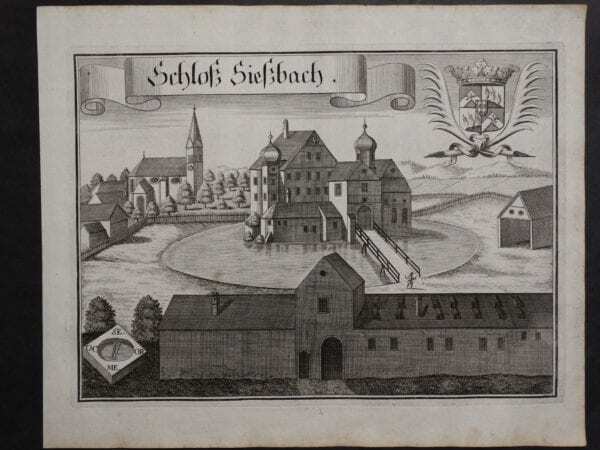 Werning Bavaria Rare Castle Engraving 1703(2). $300. 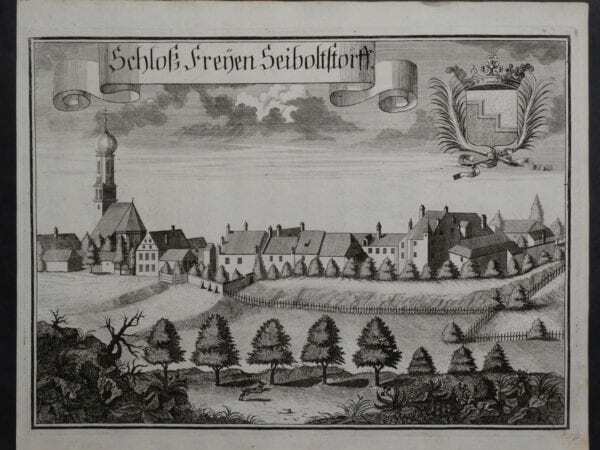 Werning Bavaria Rare Castle Engraving 1703(3). $300. 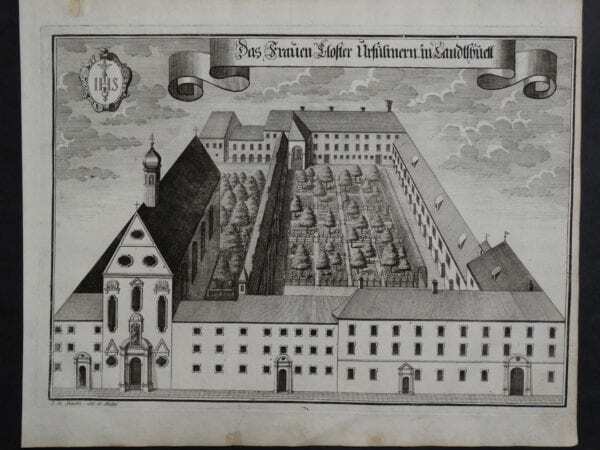 Werning Bavaria Rare Castle Engraving 1703(4). $300. 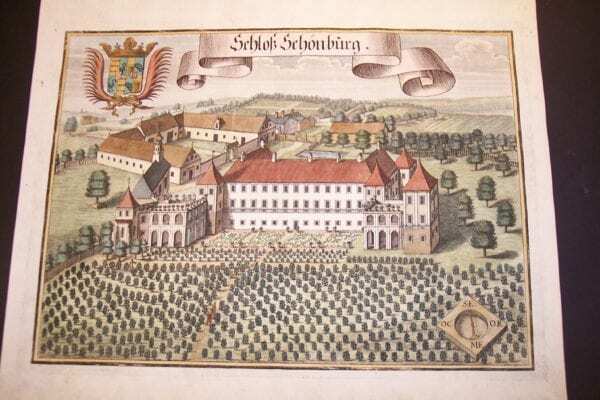 Werning Bavaria Rare Castle Engraving 1703(5). $300. 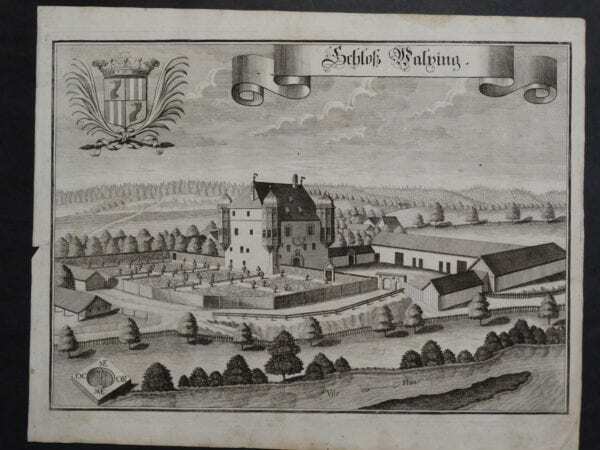 Werning Bavaria Rare Castle Engraving 1703(6). $300. 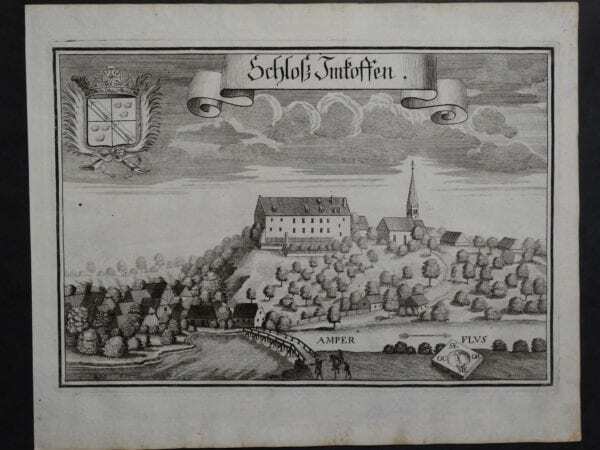 Werning Bavaria Rare Castle Engraving 1703(7). $300. 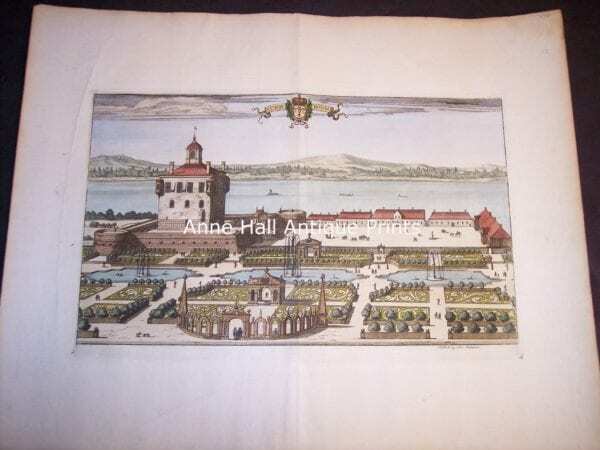 Werning Bavaria Rare Castle Engraving 1703(8). $300. 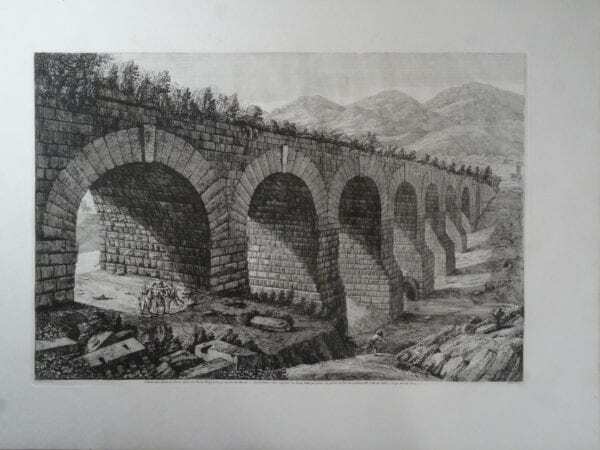 Luigi Rossini lived 1790-1857. 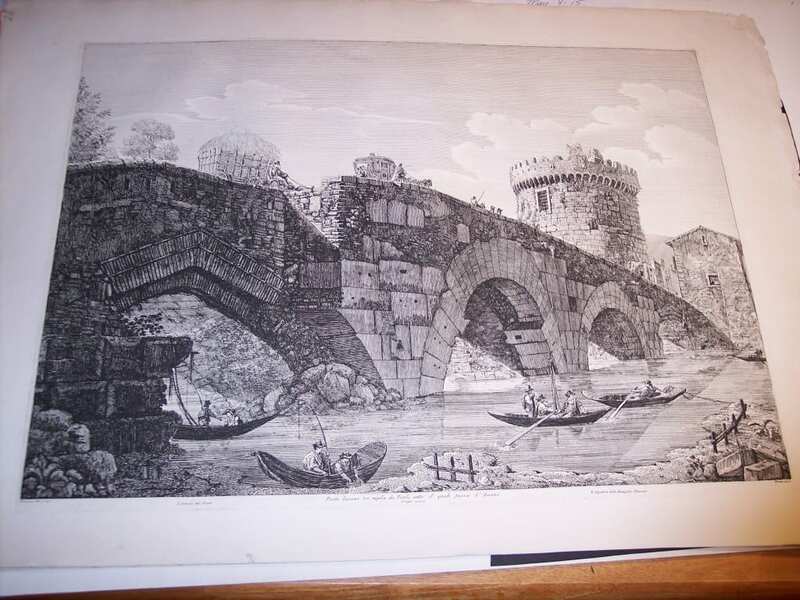 A fabulous contributor to historic Rome! 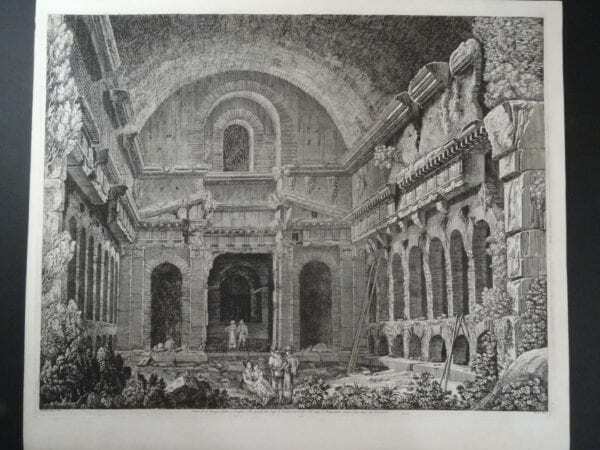 Luigi Rossini was born in Ravenna, Italy and he studied at the Academy of Bologna. Graduated in 1813 as an Architect & Artist. 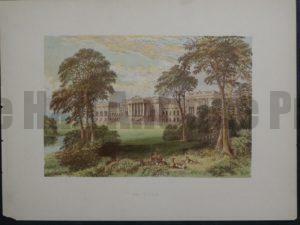 He was particularly interested in Classical Architecture of Rome and included the countryside of Roma. 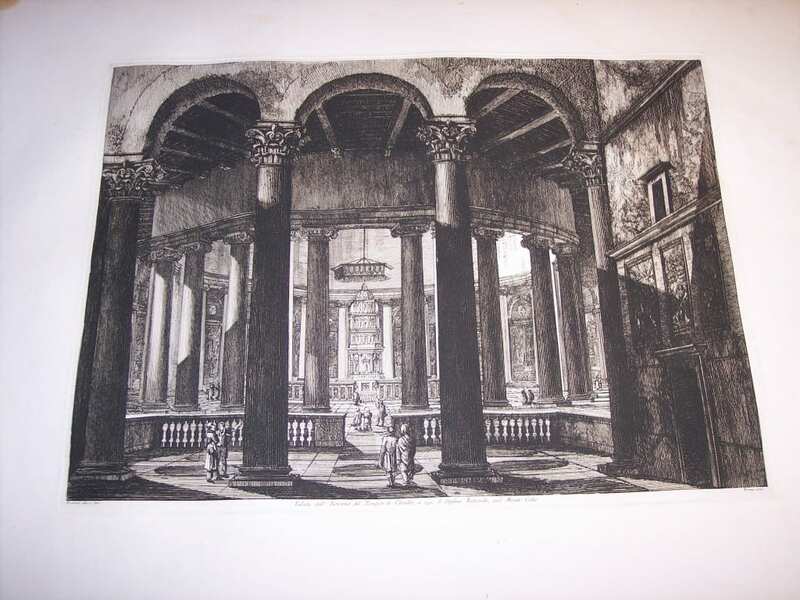 Luigi Rossini’s Ancient Roman views have influenced Classic architecture throughout the globe. 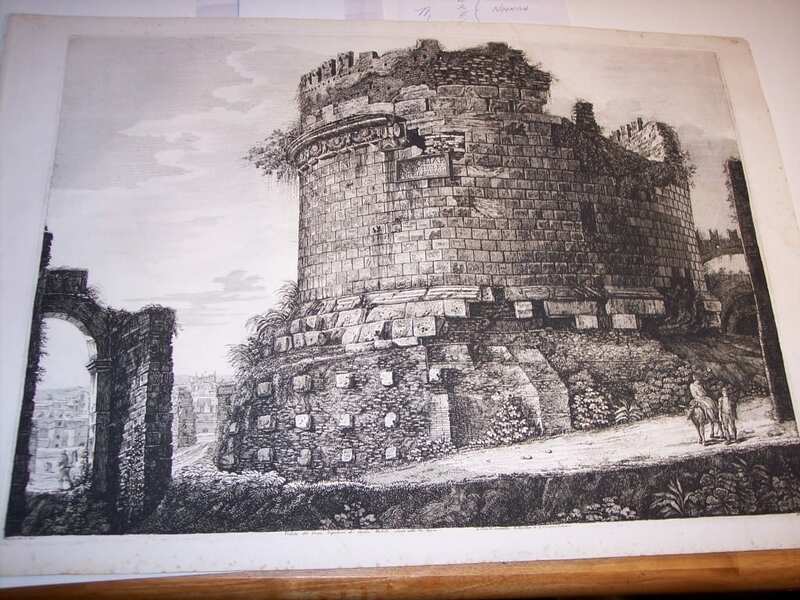 Many images of Rome published in the early 1820’s. These are impressionable: 1. because of the size and 2. because of the incredible contrasting colors. 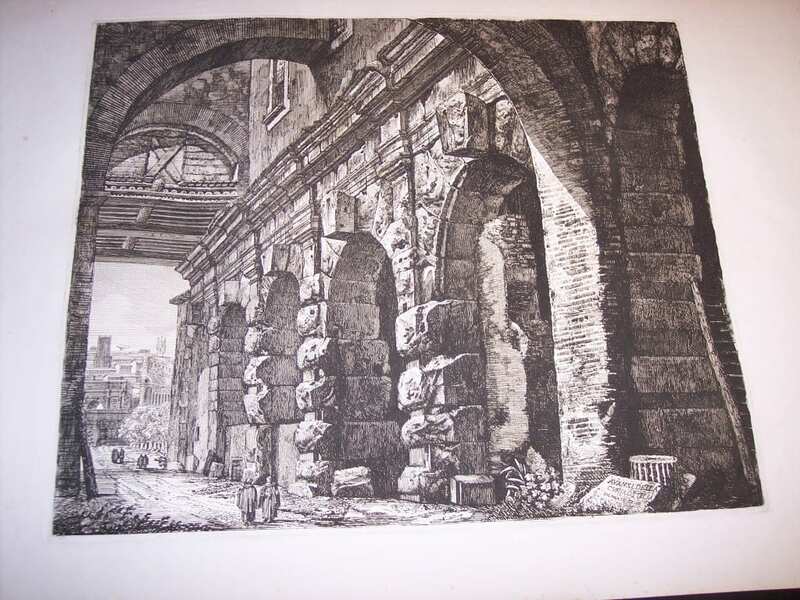 These compelling foreign views of early 19th Century Rome, are known to be some of the most impressive artwork ever published on the world scenery. 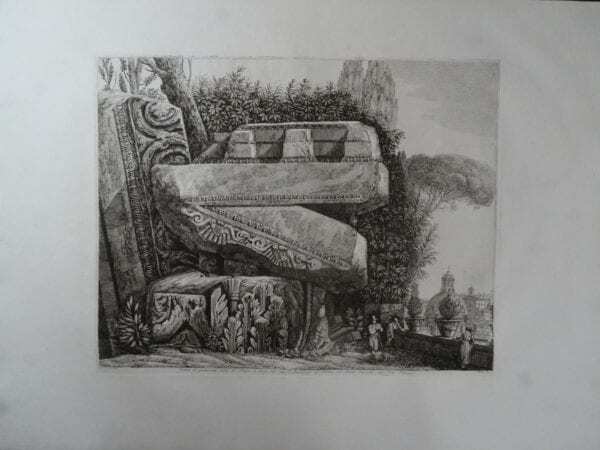 They are very large, copper plate engravings, on hand made paper, with deep dark etching. Each is an excellent, strong strike from the copper plate which was so carefully made. Click here to contact us. 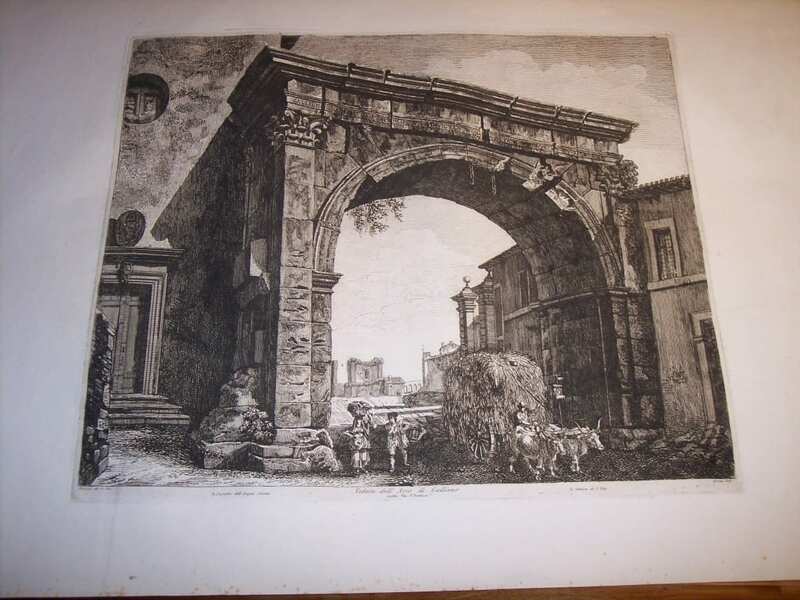 Rare etching by Rossini of Arco di Settimil, Roma 1821. $400. 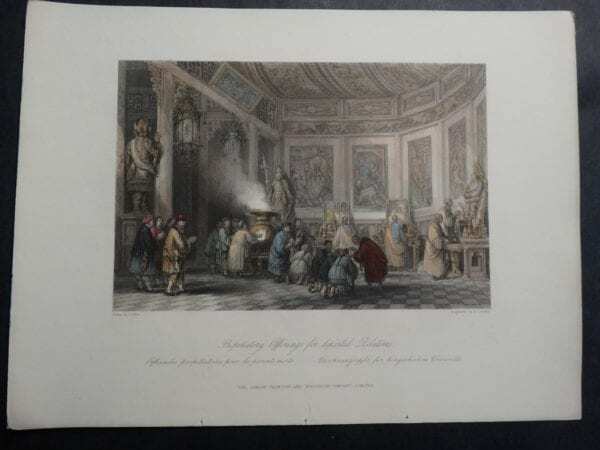 Rare foreign view of Basilica di S. Paollo, Roma 1823 by Rossini $900. 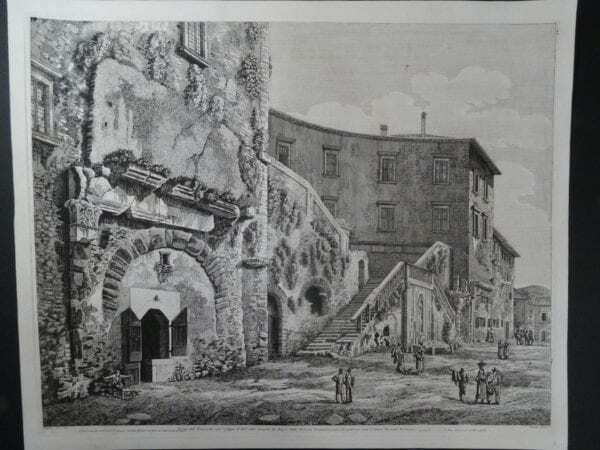 Rossini foreign view of Roma: Casa di Cola, Roma 1820. $450. 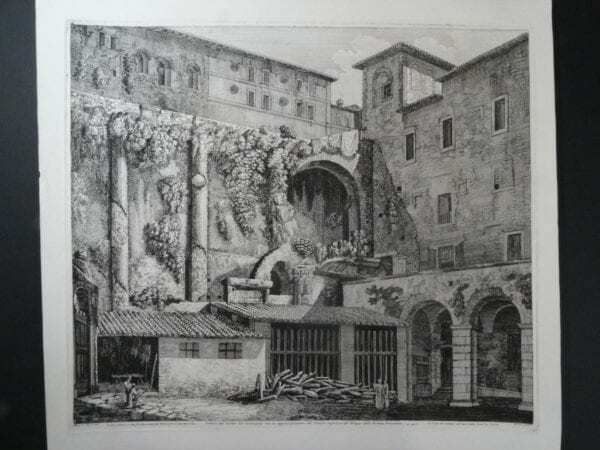 Rossini etching of Cortile de Seminario, Roma 1826. $600. 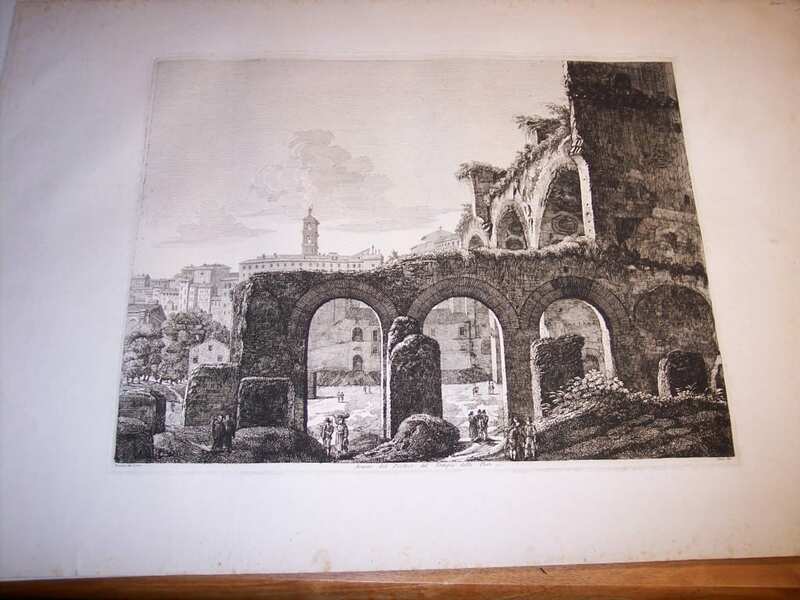 Original etching by Rossini of Emiciclo, Roma 1826 Foreign View $500. 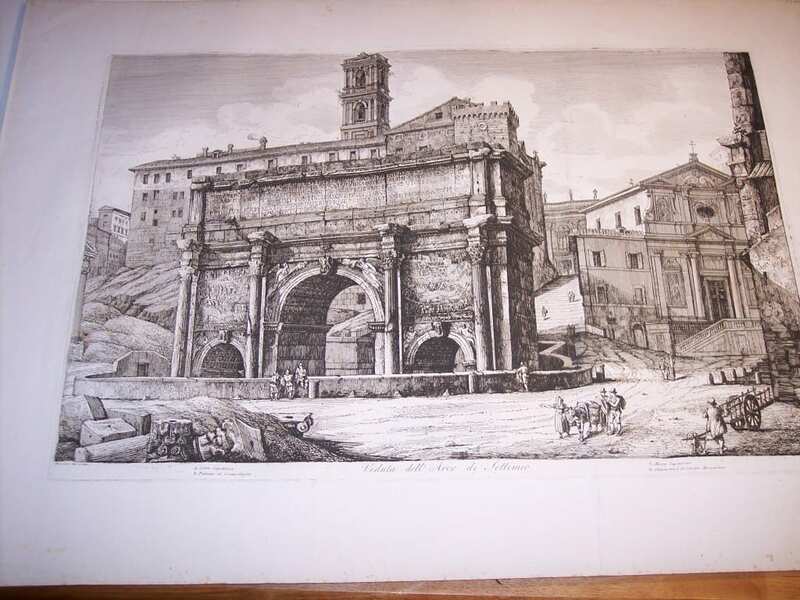 Rossini foreign view of Monumento Sepolerale, Roma 1825. $350. 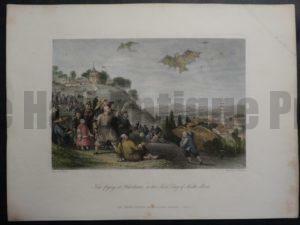 Rossini foreign view of Monumento del Condotto, Roma 1823. $400. 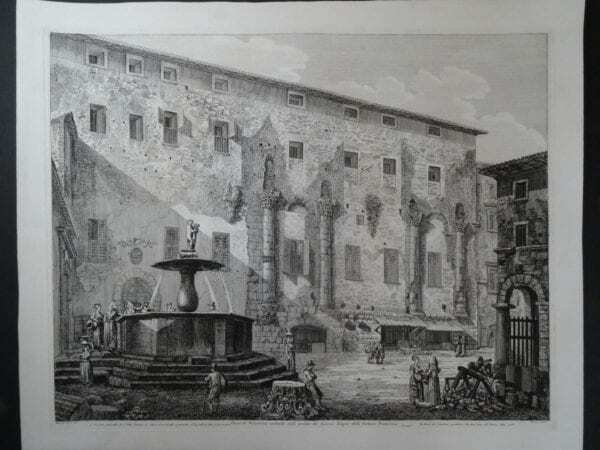 Rossini foreign view of Rome: Piazza di Palestrina, Roma 1826. $600. 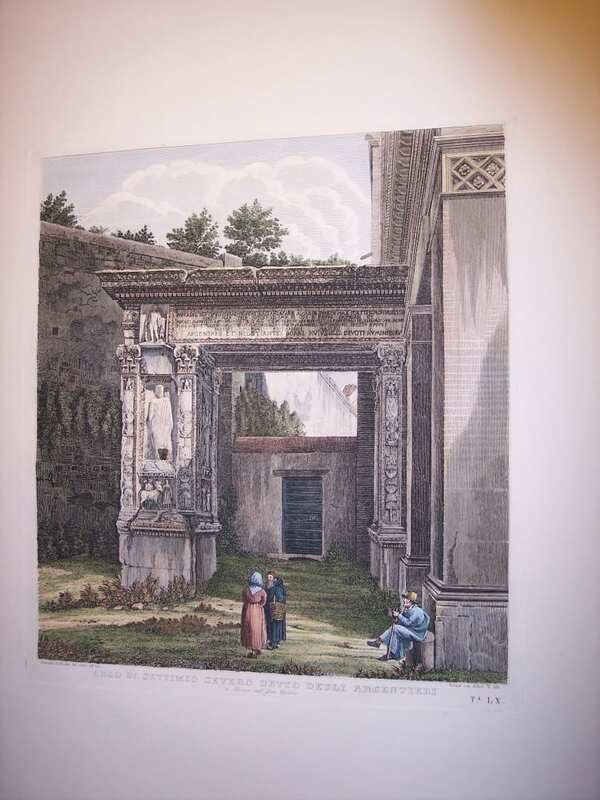 Rossini Decorative Foreign View of Tempio Antico, Roma 1826. $500. 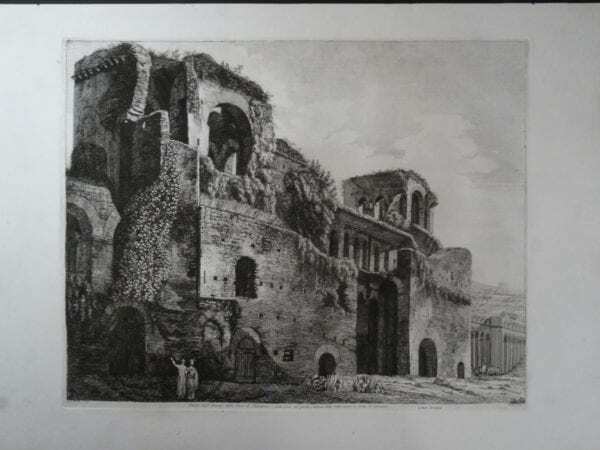 Rossini Etching of Tempio di Giove, Roma 1820. $450. 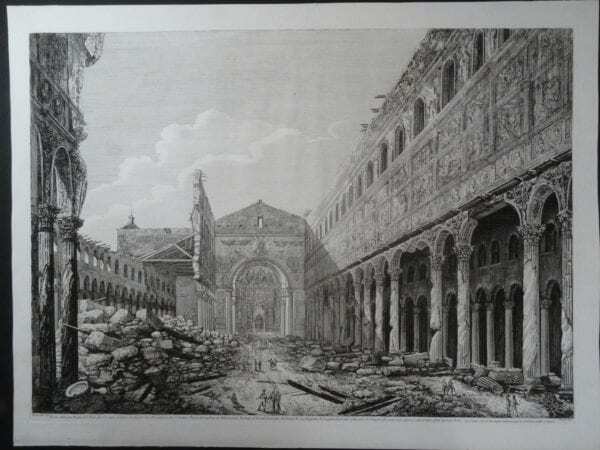 Rossini Tori de Belisario, Roma 1822. $400. 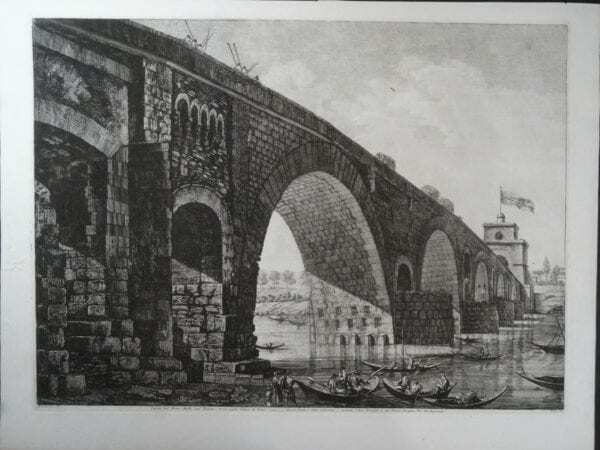 Rossini’s Veduta del Ponte di Nona, Roma 1823 $500. 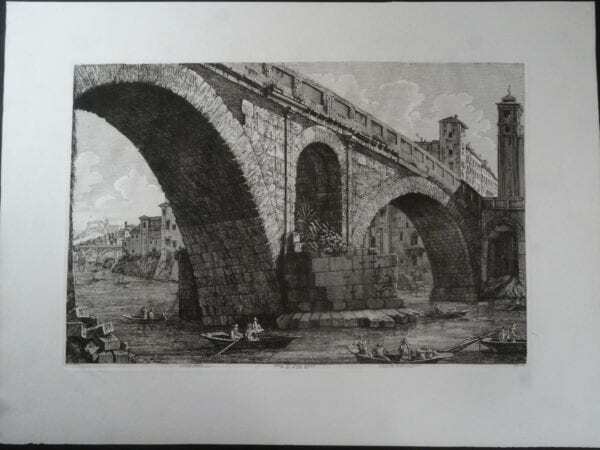 Rossini Veduta del Ponte Molle, Roma 1822 $500. 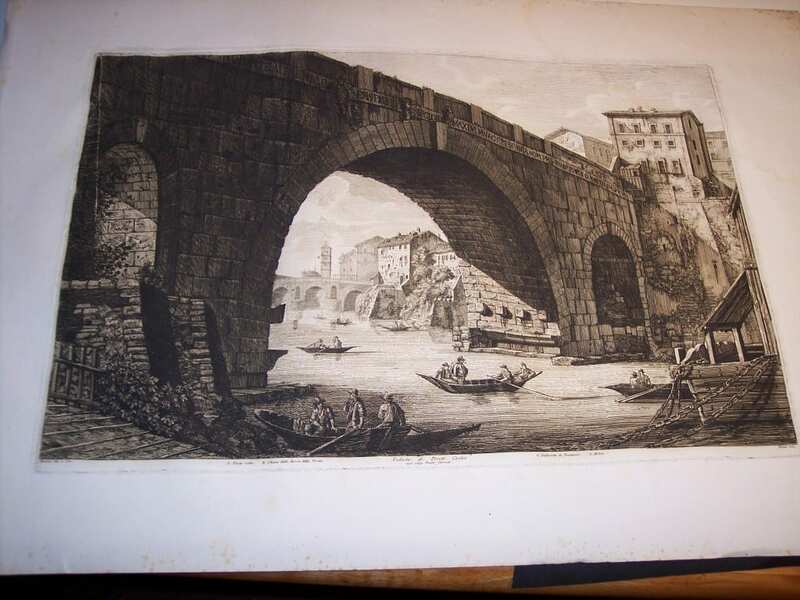 Veduta di Ponte Fabrizio, Roma 1822, by Rossini $500. 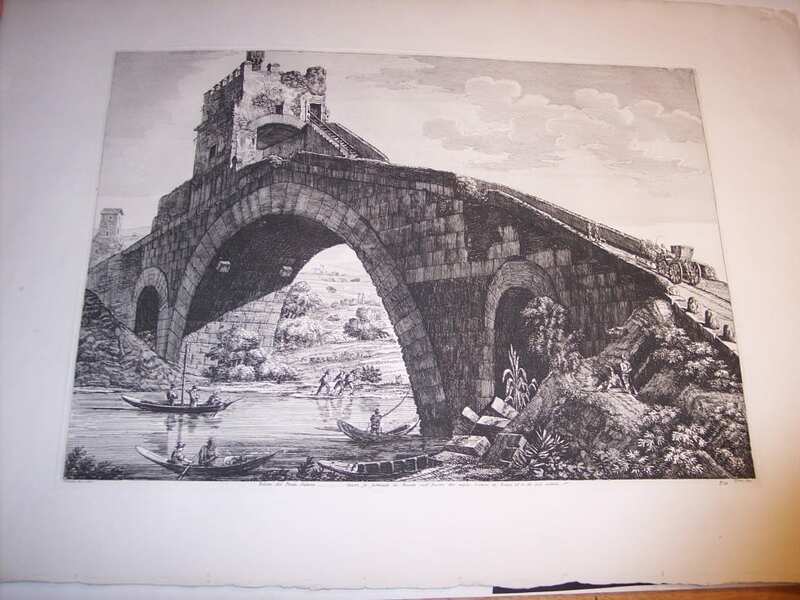 Rossini Etching of Roman Bridge #8060 $500. 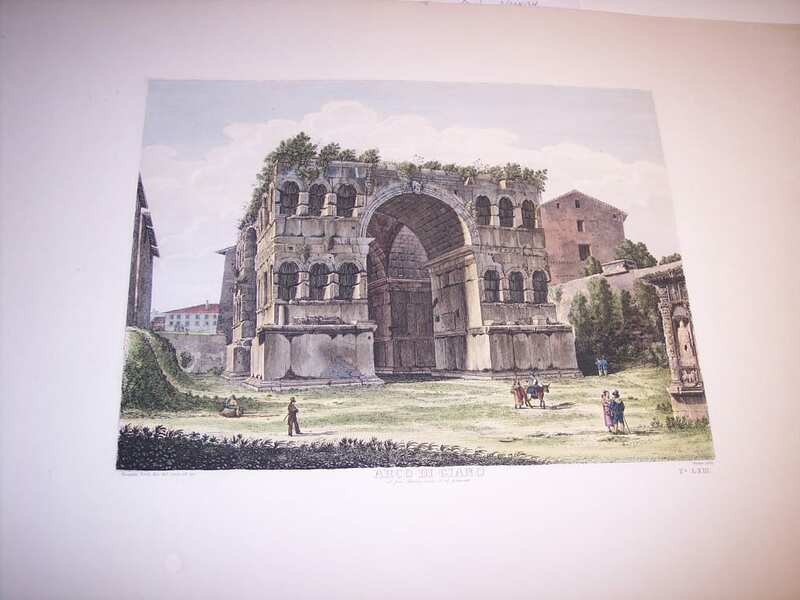 Rossini Engraving of 19th Century Rome #8064 $450. 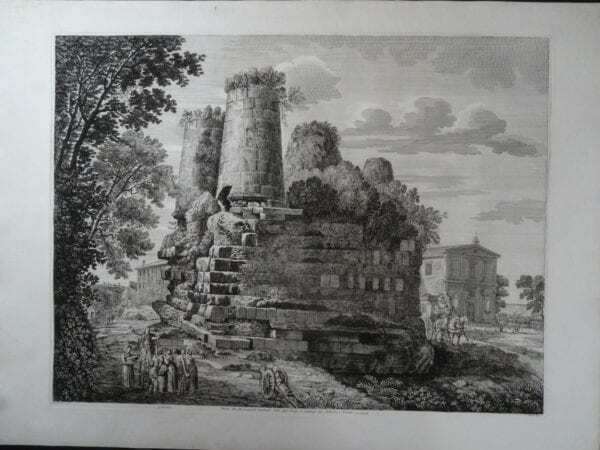 Rossini Engraving of Rome #8065 $450. 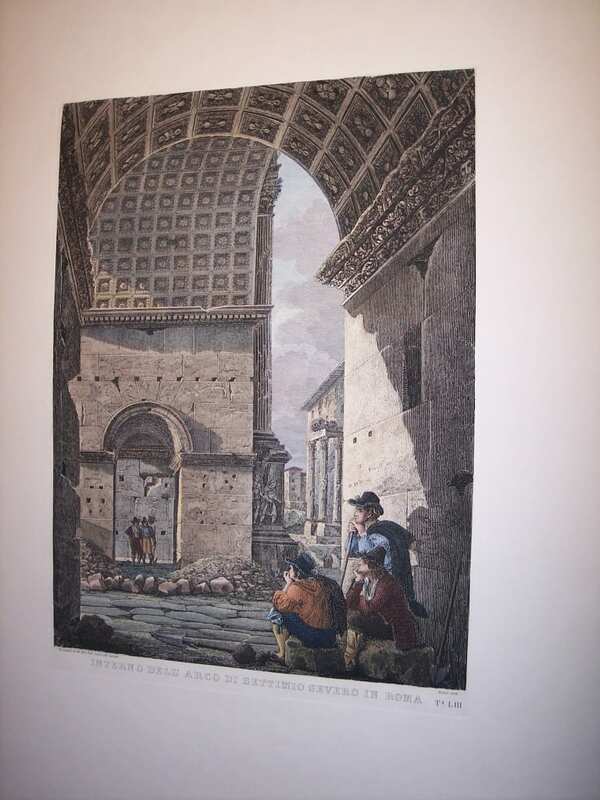 Rossini Engraving of Rome 8067 $1200. 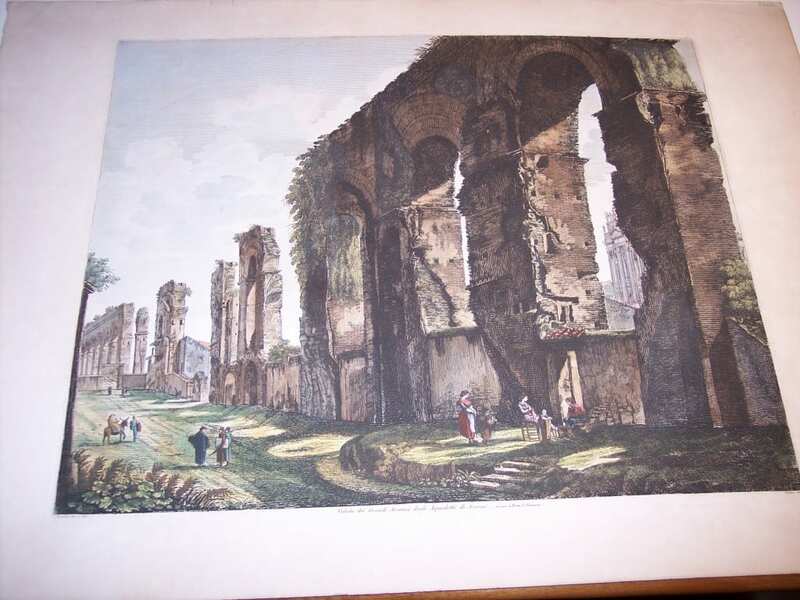 Rossini Antique Engraving of Rome c.1820 #8068 $450. Rare foreign view by Rossini Rome 1820’s Engraving $450. 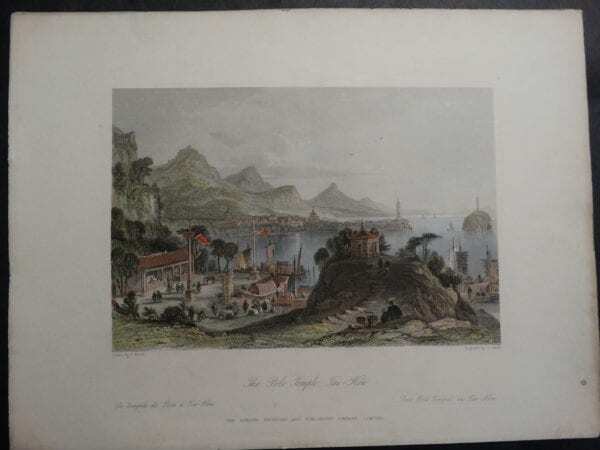 Rossini Engraving of Roma during the 1820’s #8066 $600. 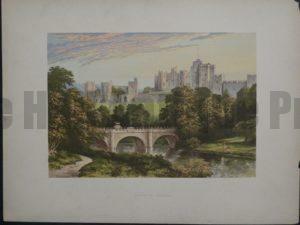 Rossini Etching of Roma 1820’s #8063 $500. 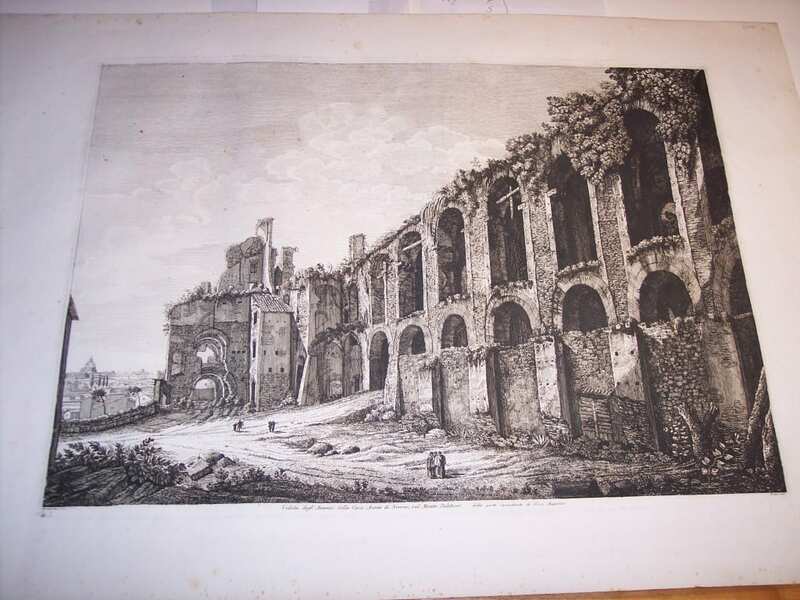 Rossini Antique Etching of Rome #8070 $1000. 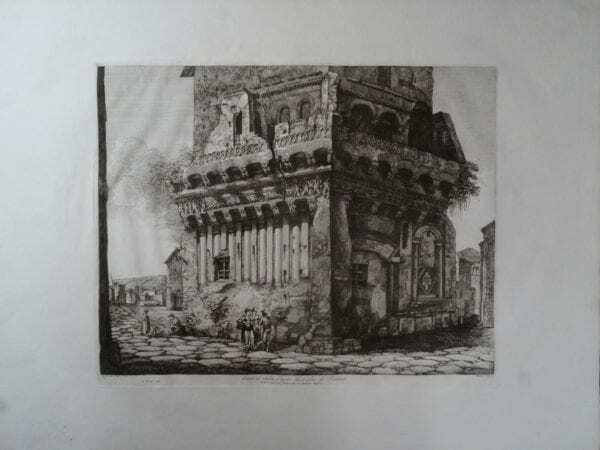 Rossini Copper Plate Etching of Rome #8071 $700. 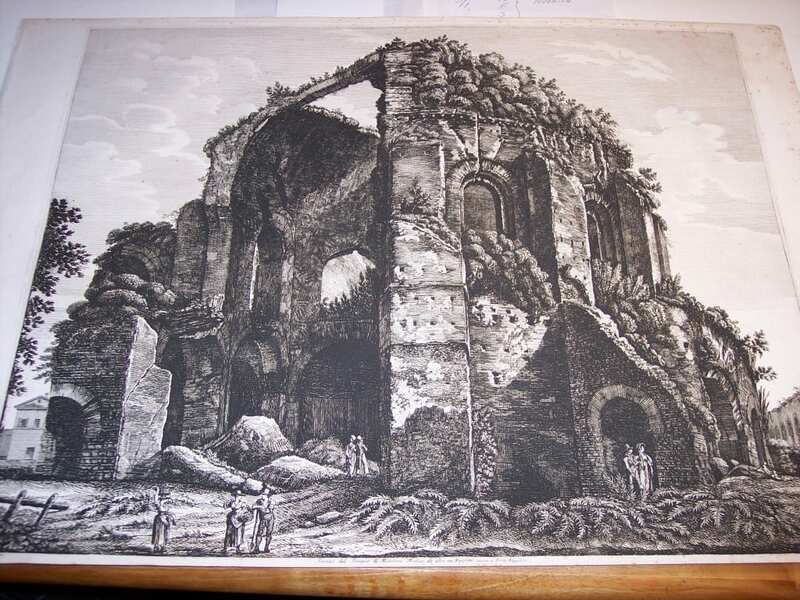 Antique Rossini Etching Ruin #8072 $400. 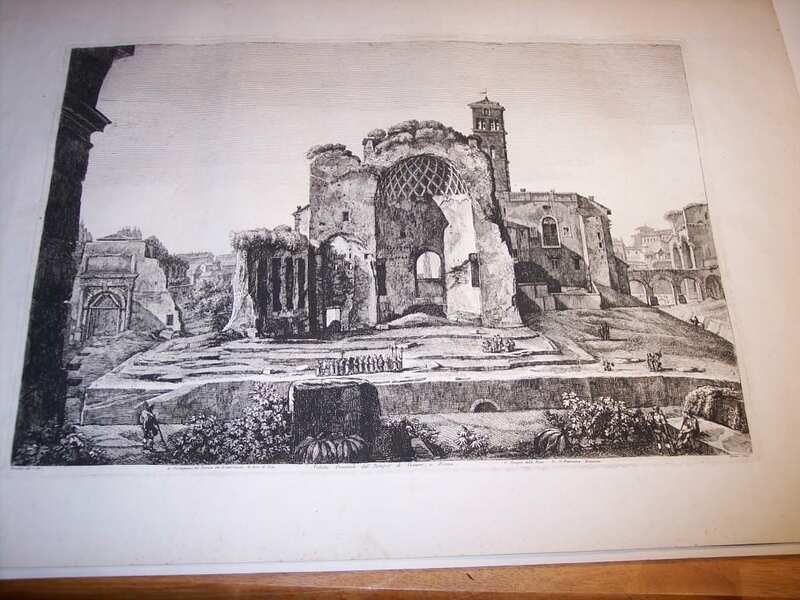 Rossini Antique Etching of Rome #8074 $1200. 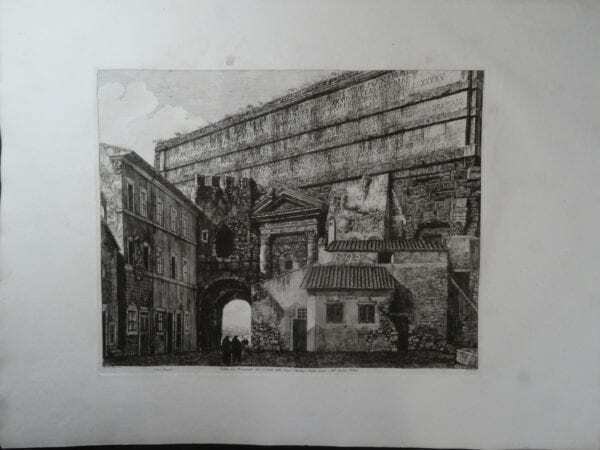 Rare Rossini Etching of Rome #8073 $400. 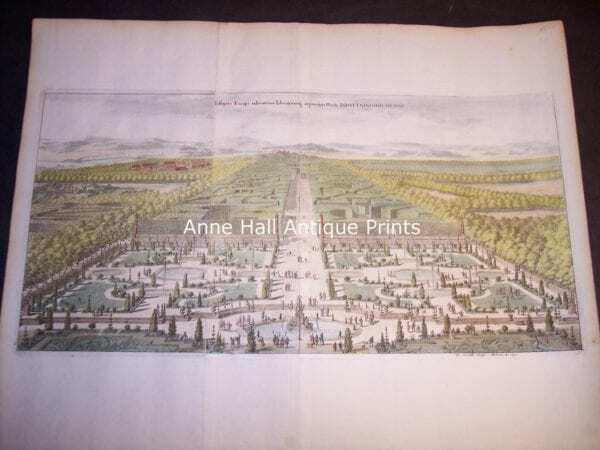 Michael Wening’s Decorative Views of Bavaria Date to 1703! These are very rare copper plate engravings on hand made hand laid rag with outstanding hand coloring. 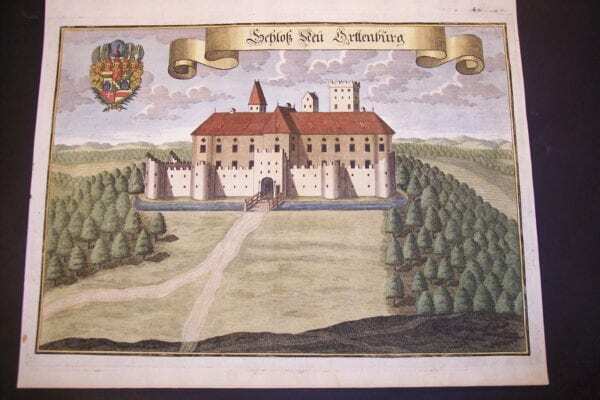 A decorative crest and ribbon adorn each Castle. Each is in vivid and bright pristine condition. $350. each. Click here to contact us. 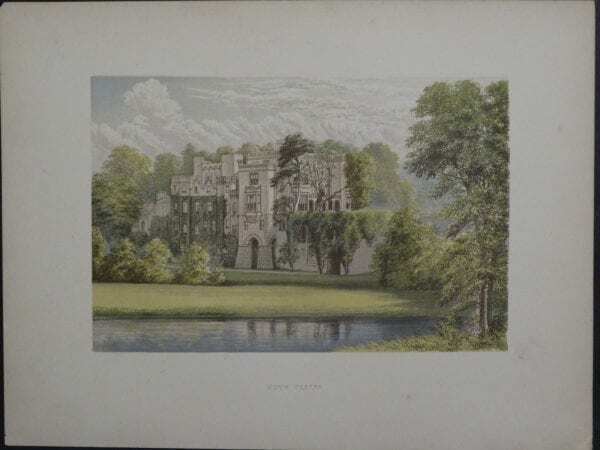 Guy’s Cliffe, c.1880. Sold Call for a custom set $45. each. 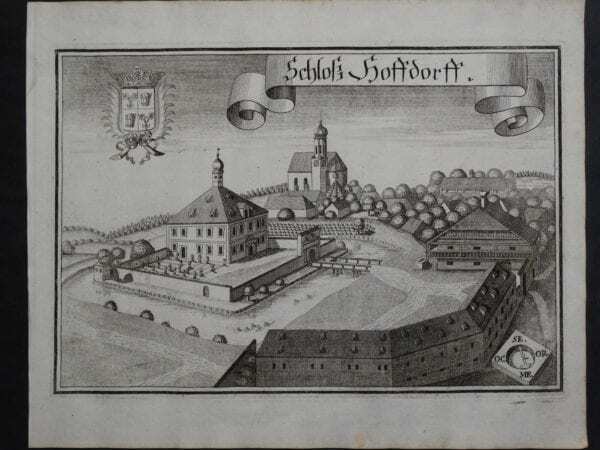 Foreign Views of old Sweden, now Scandanavia by Colonel Dahlberg. 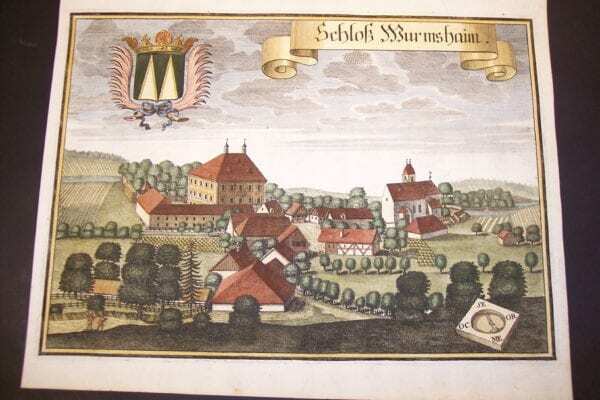 1697-1713. 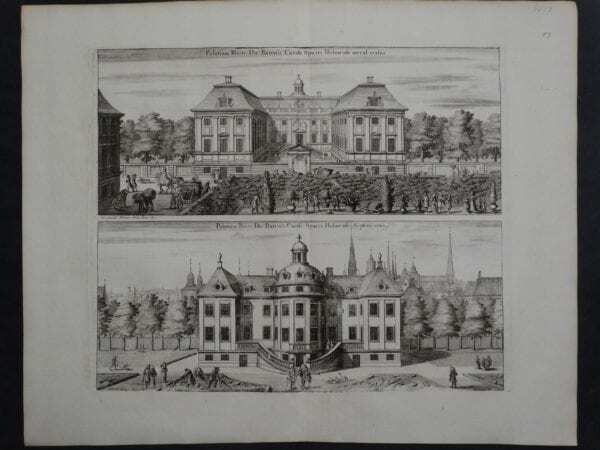 These Decorative Scandanavian Views were published from 1697-1713. 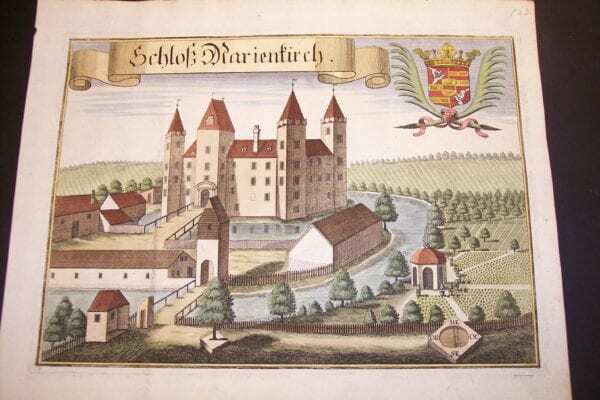 Colonel Dahlberg illustrated views around Sweden which included much of today’s Scandanavia. 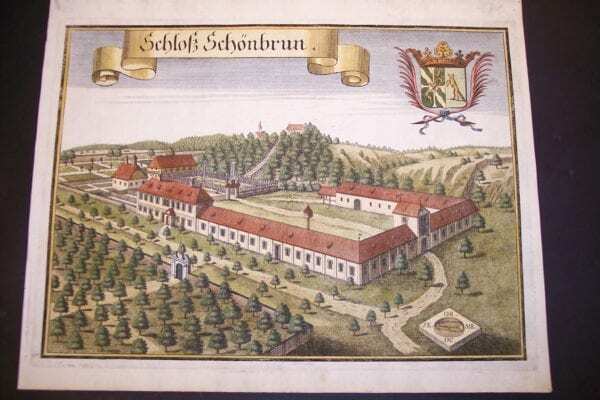 Many of the estates depicted in these old illustrations still exist today. 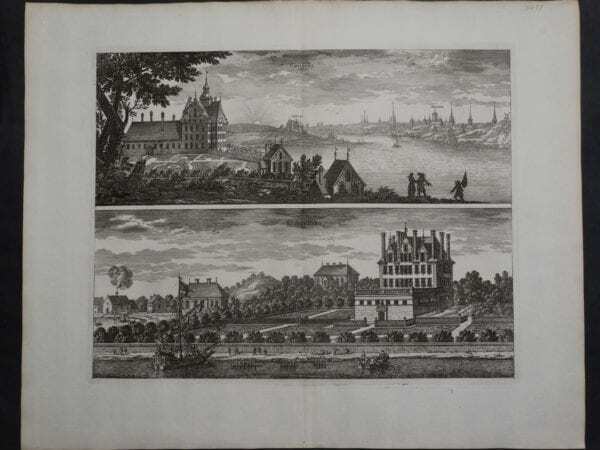 The perspectives are unique, giving the viewer insight as to construction and enormity of estates. 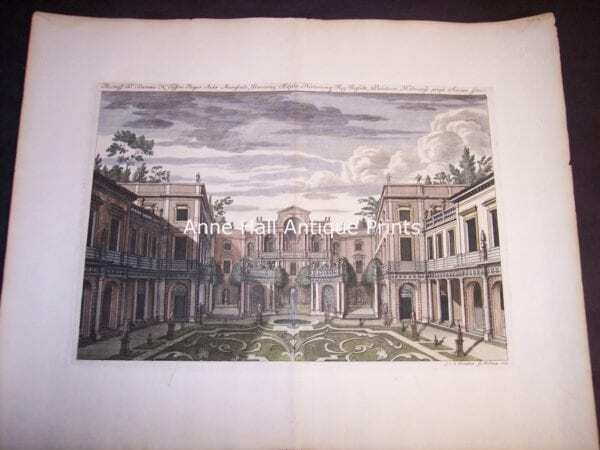 These are rare copper plate engravings on hand made hand laid linen rag with water coloring. 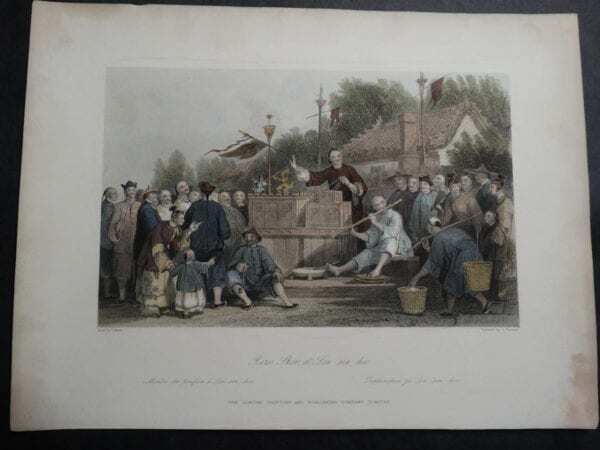 The paper measures about 14 x 18″ and the prints are in very good condition. Click here to contact us. 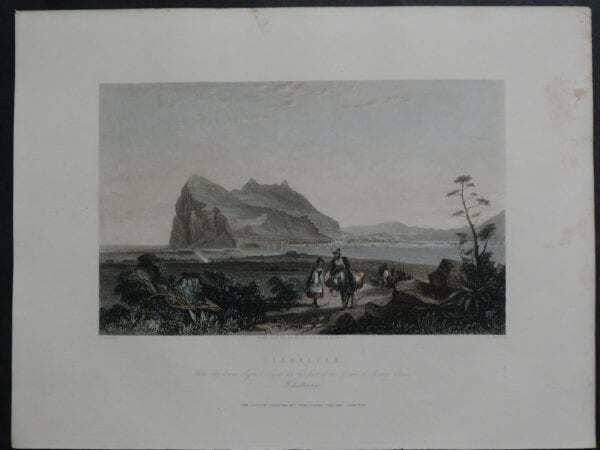 Decorative Foreign Views of Scandanavia by Colonel Dahlberg without water colours. 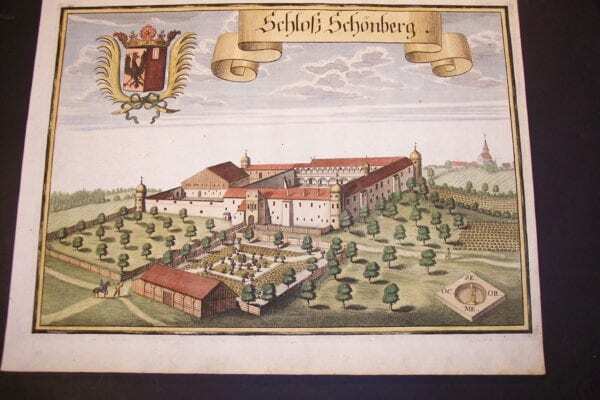 Dahlberg’s Decorative Views were published from 1697 to 1713. Colonel Dahlberg illustrated views around Scandinavia. 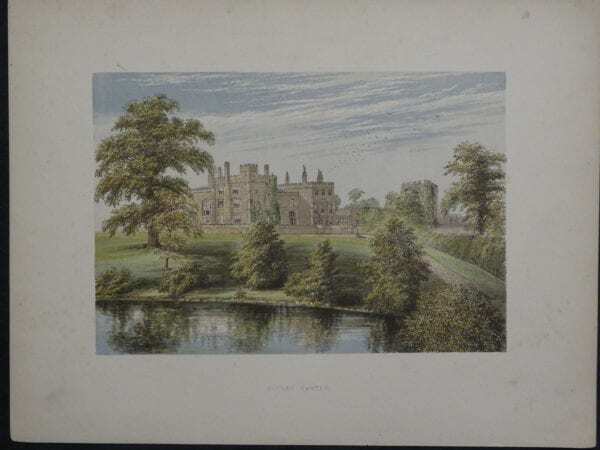 Many of the estates depicted in these old illustrations still exist today. 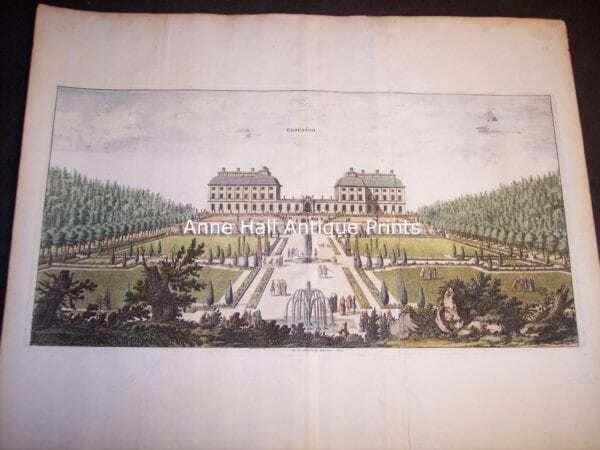 The perspectives are unique, giving the viewer insight as to construction and enormity of estates. 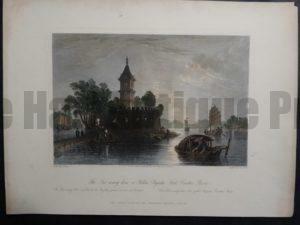 These are rare copper plate engravings on hand made hand laid linen rag. The paper measures about 14 x 18″ and the prints are in very good condition. Click here to contact us. 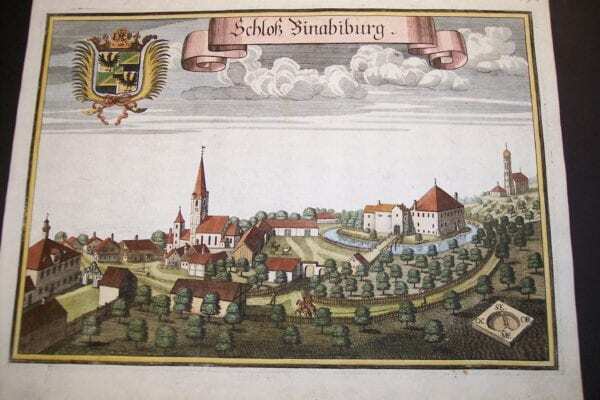 Dahlberg Copper Engraving from 1697-1713(1) $175. 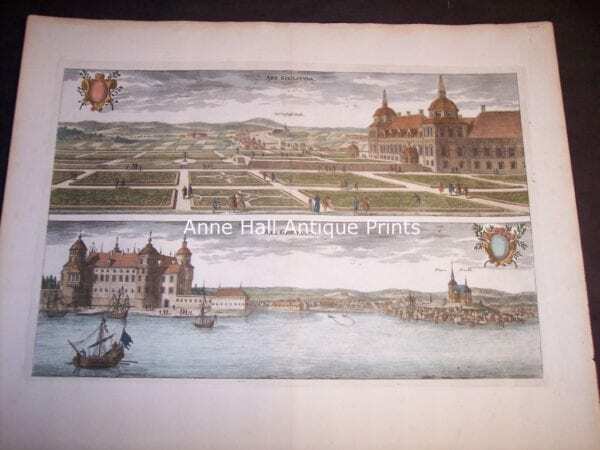 Dahlberg Copper Engraving from 1697-1713(2) $175. 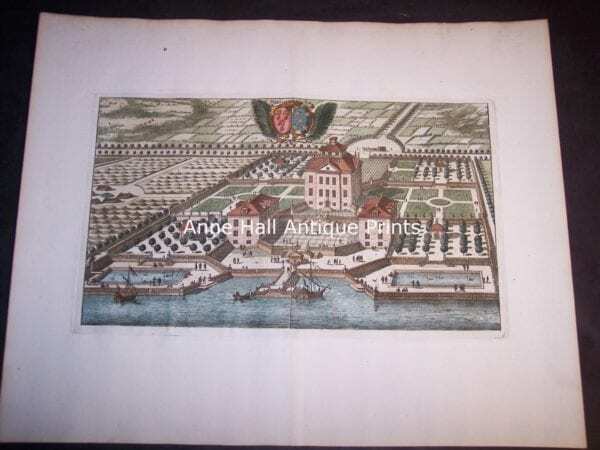 Dahlberg Copper Engraving from 1697-1713(3) $175. 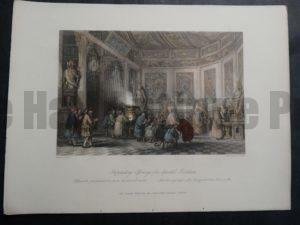 Rossini’s Rome Huge & Decorative Foreign Views of Italy in the Early 1800’s. 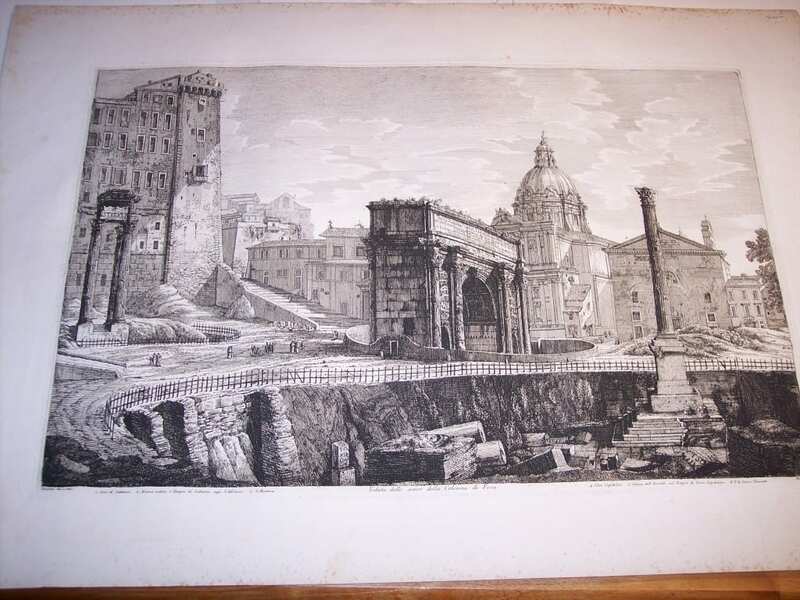 Rossini’s Views of Roma, Rome, Italy are large and EXTREMLEY DECORATIVE OLD ETCHINGS published during the early 19th Century. 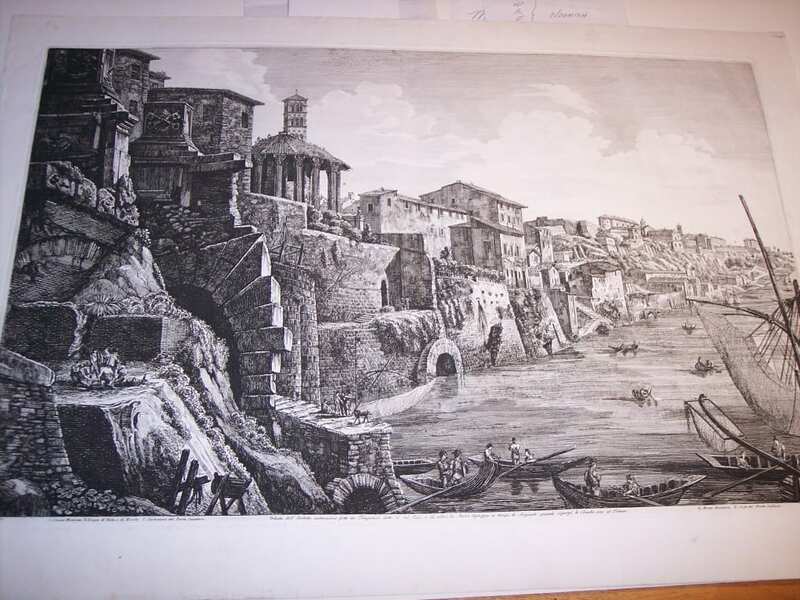 They are some of the most impressive artwork from the early 1800’s of Italy. The perspectives are compelling. These are very large copper plate engravings with deep dark etching, printed onto beautifully crafted hand made rag. The following have had water colors added. Click here to contact us. 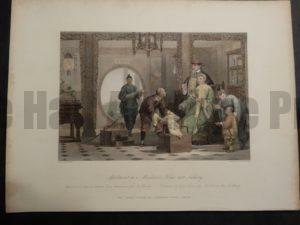 Rossini Decorative Antique Etching of Rome Hand Colored #8076 $500. 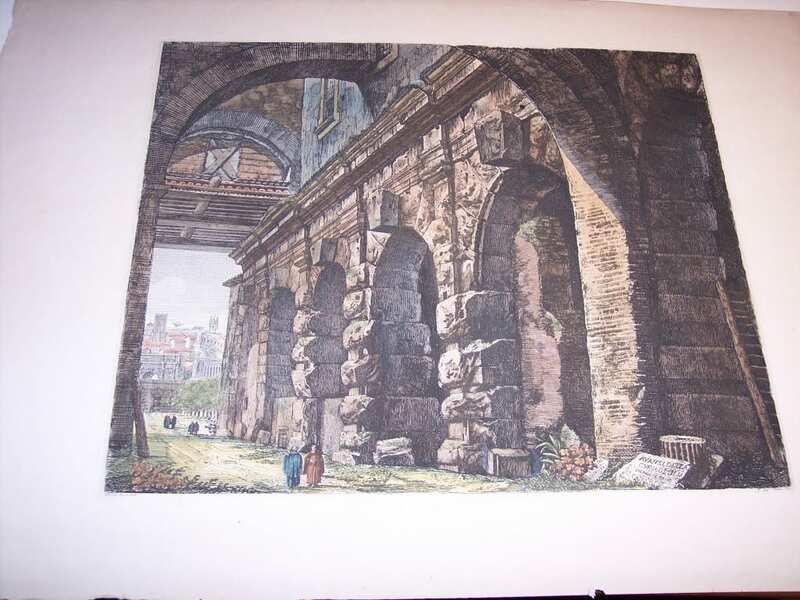 Rossini Decorative Antique Etching of Rome, Hand Colored #8075 $500. 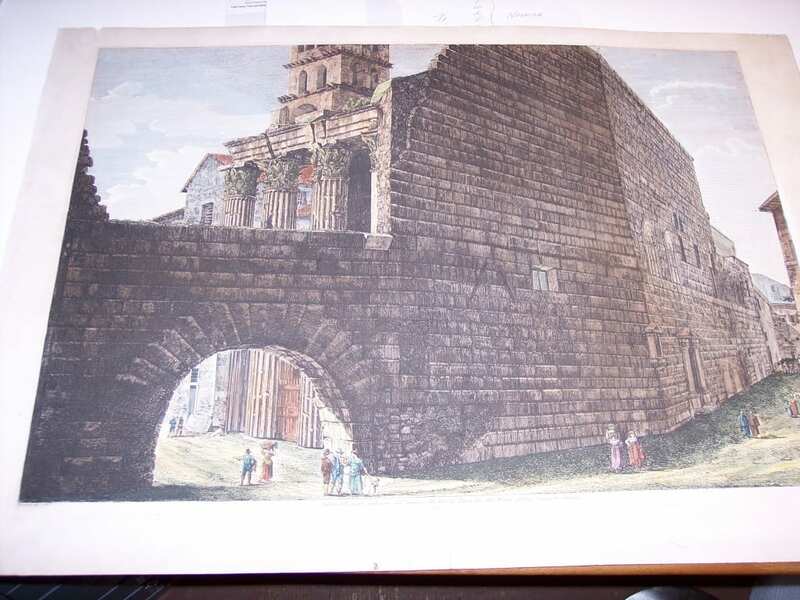 Rossini Decorative Etching of Rome, c.1820, Hand Colored #8078 $500. 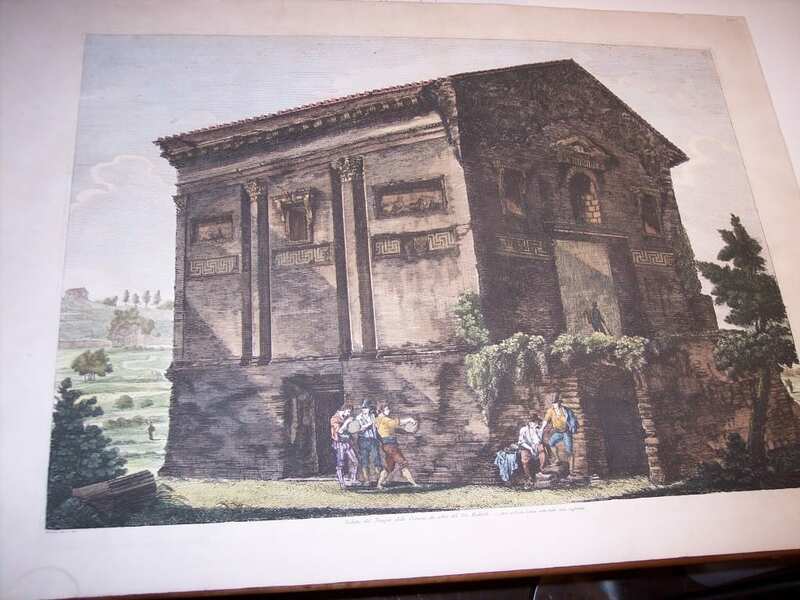 Rossini c.1820 Antique Etching of Rome, Hand Colored #8077 $500. 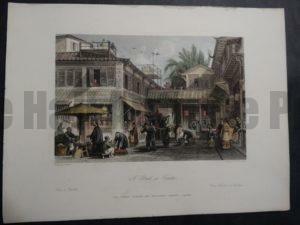 Rossini Antique Etching of Rome Hand Colored #8079 $500. Rossini c.1820 antique engraving with water colors #8080 $500. 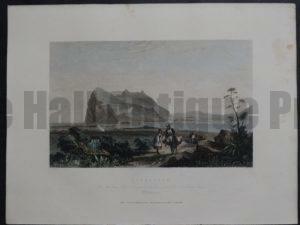 Rossini c.1820 antique engraving with water colors 8081 $400. 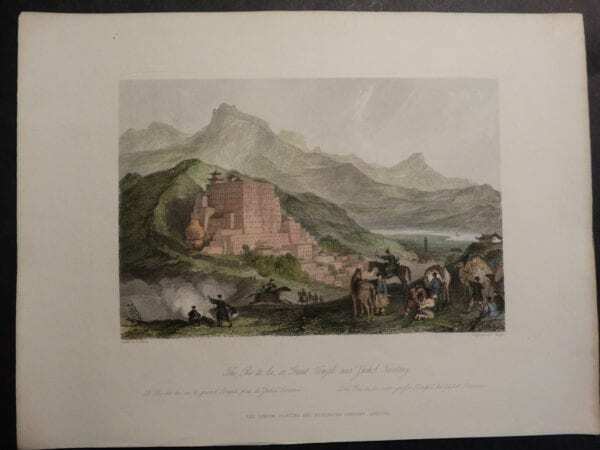 Rossini c.1820 antique engraving with water colors #8083 $400. 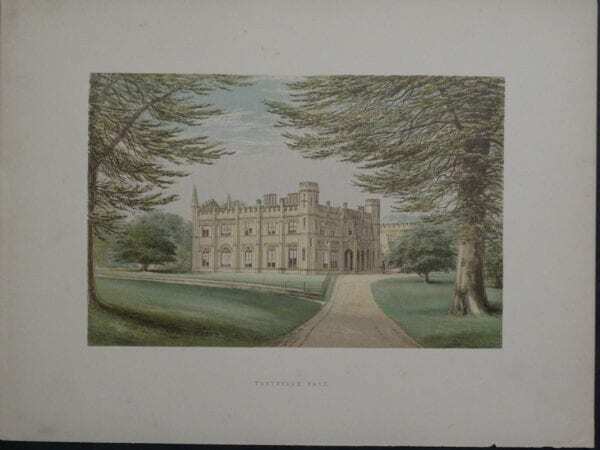 Foreign Views: Roman Engravings by Luigi Rossini, Scandanavia Castles by Colonel Dahlberg, and Bavarian Castles by Werning. These antique decorative views are old foreign views by Thomas Allom, Colonel Dahlberg, Rossini, and other early decorative illustrators and architects. The sizes range from the huge antique copper plate engravings with etchings of Rome by Rossini published during the 1820’s to small estate chromolithographs of Great Britain. 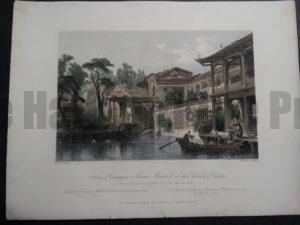 We also sell small and rare Chinoiserie prints by Thomas Allom from 1855. Life in China during the 1850’s. 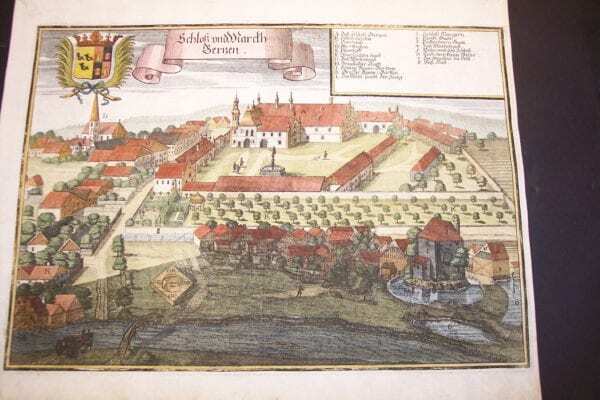 Michael Werning’s views of Bavaria from the early 1700’s. 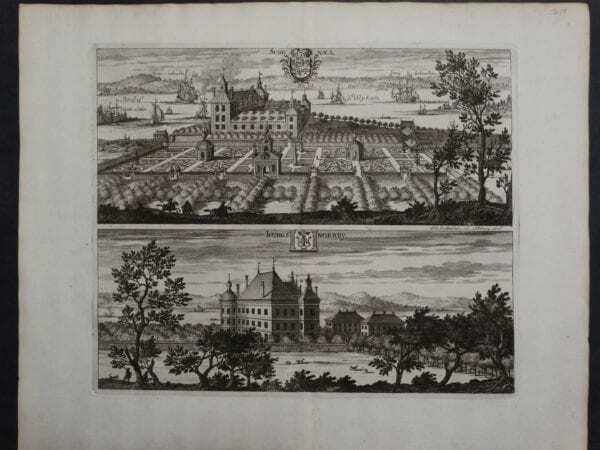 Colonel Dahlberg’s rare views of Scandinavia from 1697-1713. 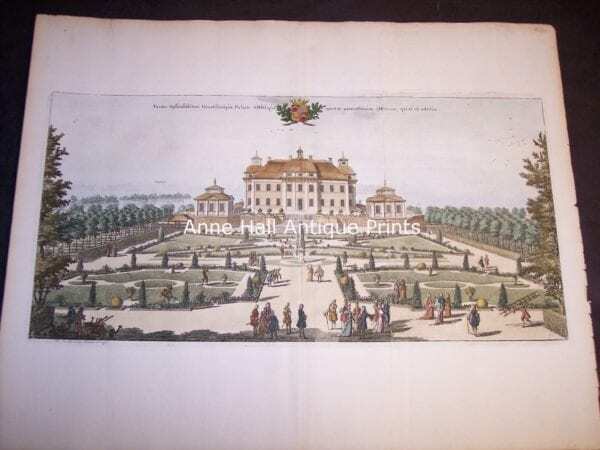 His is a rare and fantastic work on Scandinavian monumental estates c.1700 by Dahlberg and Bavarian views by Werning with crests and ribbons that are superbly decorative. 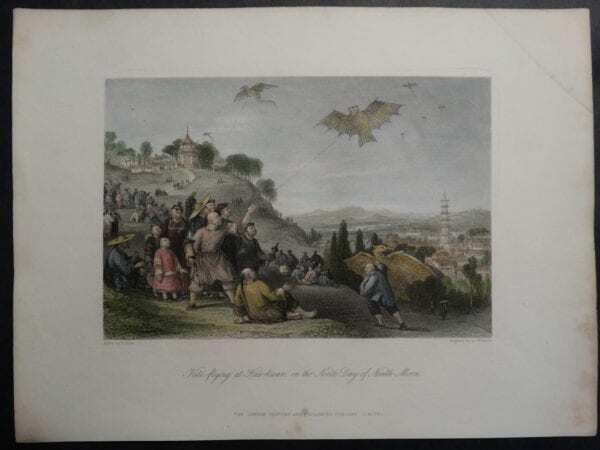 The Dahlberg and Werning views are hand colored copper plate engravings on hand made hand laid linen rag. 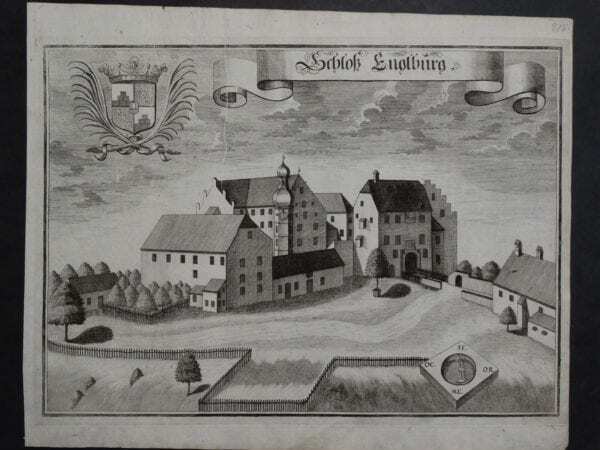 Dahlberg’s Architecture around Scandanavia from c.1690-1713 is considered the rarest produced on Sweden. 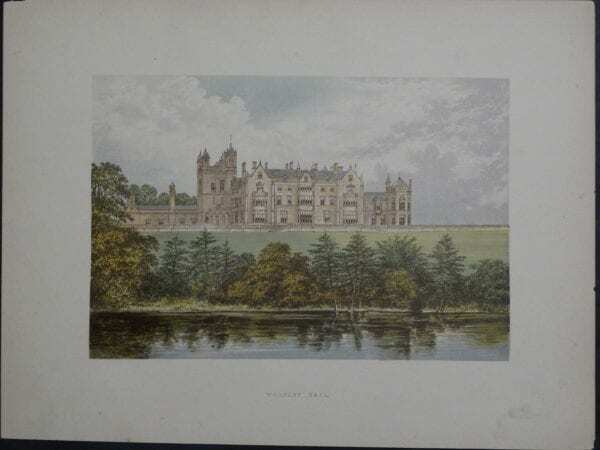 Vintage prints of places in foreign lands, architectural subjects. Old architectural engravings and lithographs produced 1640-1900.